My two daughters went back to school today after six weeks off for summer. 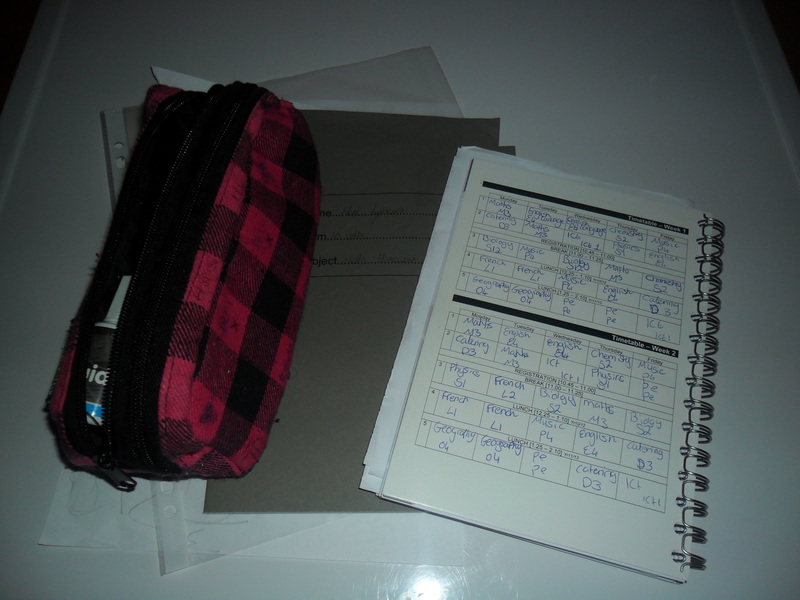 My day was really quiet without them. I always miss my girls so much when they go back to school after the long summer holidays and for the first few days I feel like a big part of me is somehow missing. 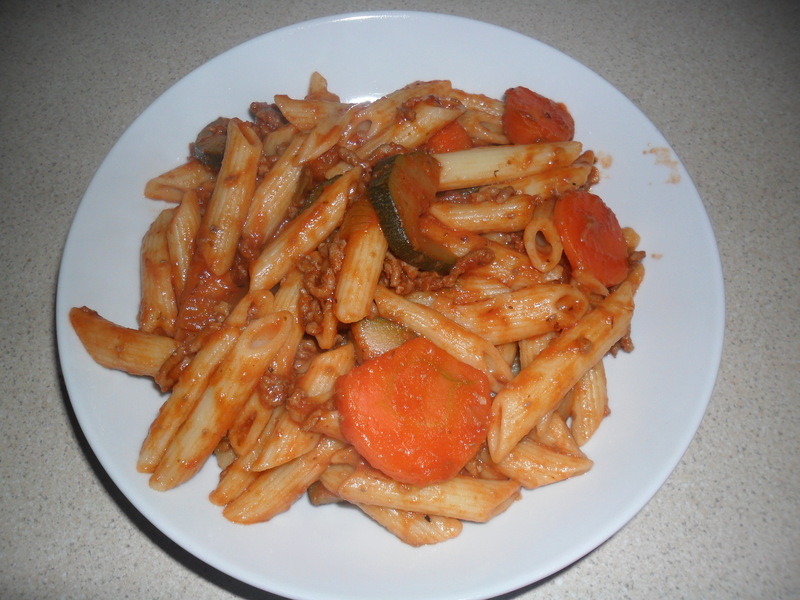 I decided to cook a meal for dinner, that they both really enjoy…the humble ‘Pasta Bolognese’. 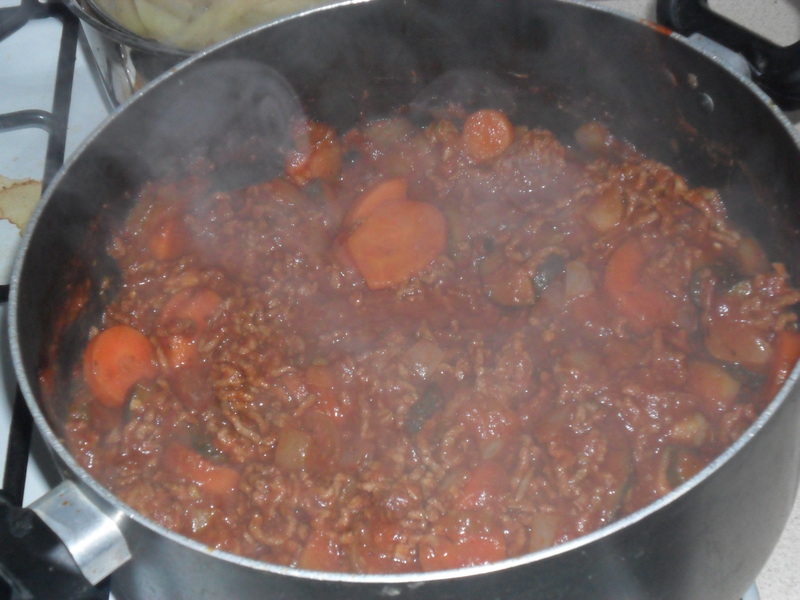 I make the bolognese sauce the same as everyone does it, but I use my own passata and add loads of my home grown vegetables. 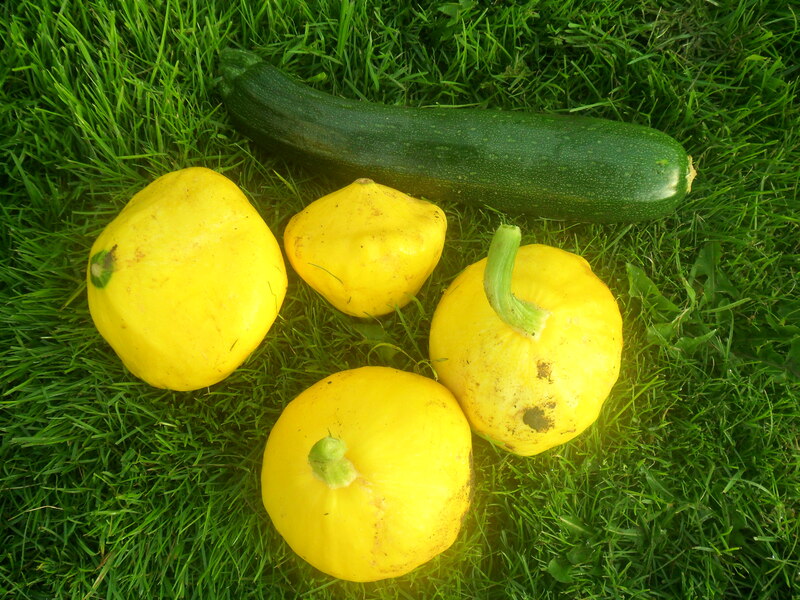 The homegrown vegetables I used in tonights sauce were tomatoes (for the passata), courgettes, garlic, onion, basil, broad beans, carrots and runner beans. 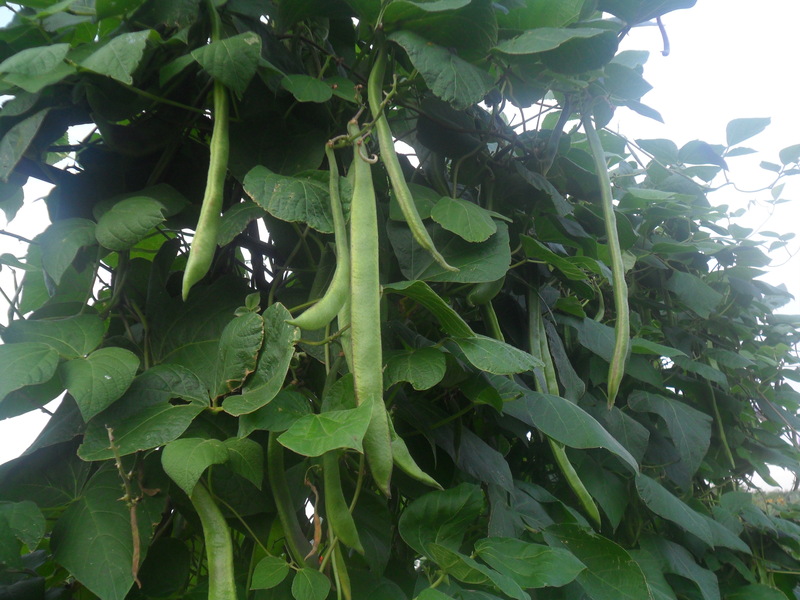 (Incidentally, my husband and daughter both think they don’t like runnerbeans or broadbeans, but they don’t know they are actually eating them, as I cook them in a separate pan and then puree them down and mix them in at the end). No one can accuse our family of not having our ‘five a day’. The only things I paid for was 800 grams of minced beef and a sprinkling of dried oregano and the dried pasta, so it was a really cheap meal to make. 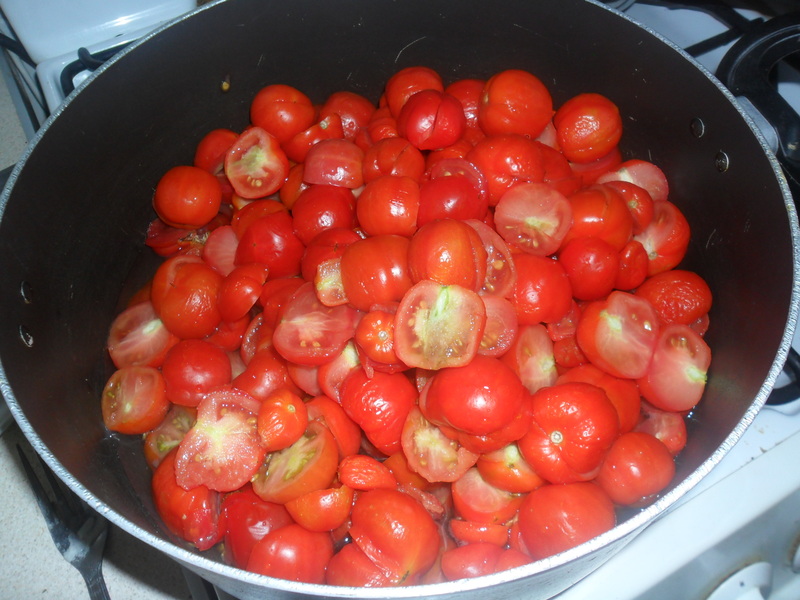 I made a great big pot full of the sauce and I separated it into three. One for tonight and two to freeze for another time. 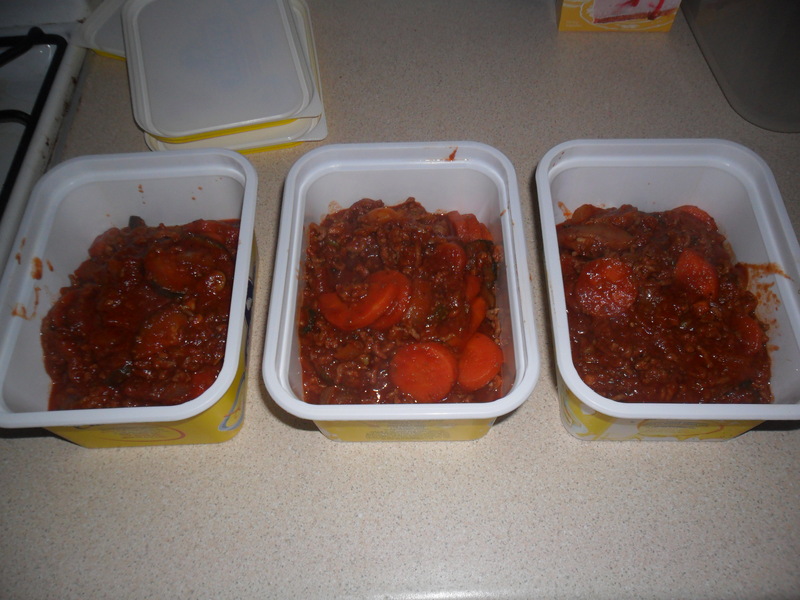 If I need a quick meal one evening, I just defrost the bolognaise sauce before hand and then re-heat it in the microwave, until it is piping hot, and serve it with pasta. 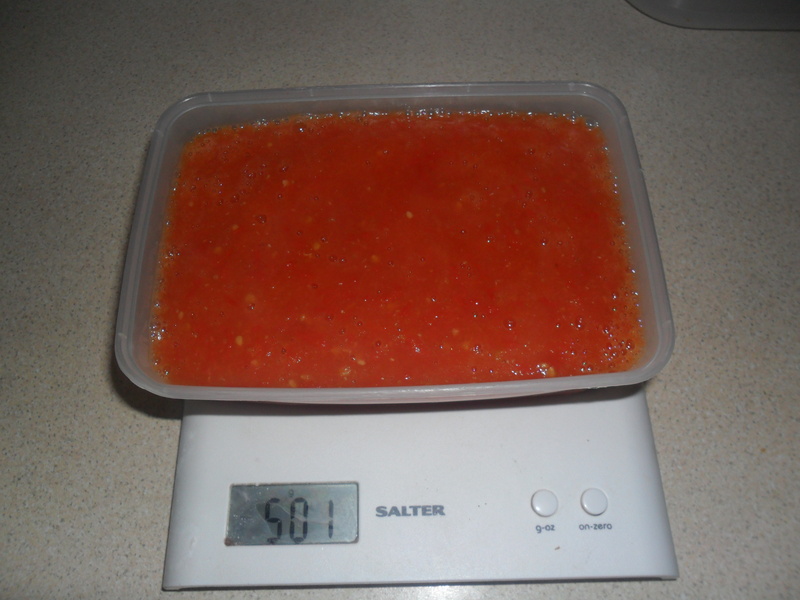 I’m sure that homemade bolognaise sauce is much better for you, than a jar you buy from the supermarket, that has lots of ‘e-numbers’ and preservatives. 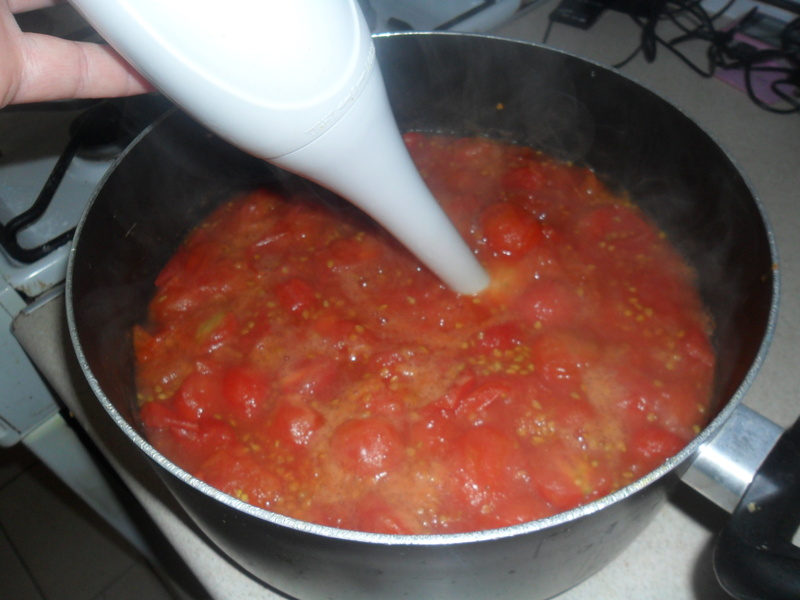 A homemade sauce will probably have more meat in it too, even though I padded it out with lots of vegetables. 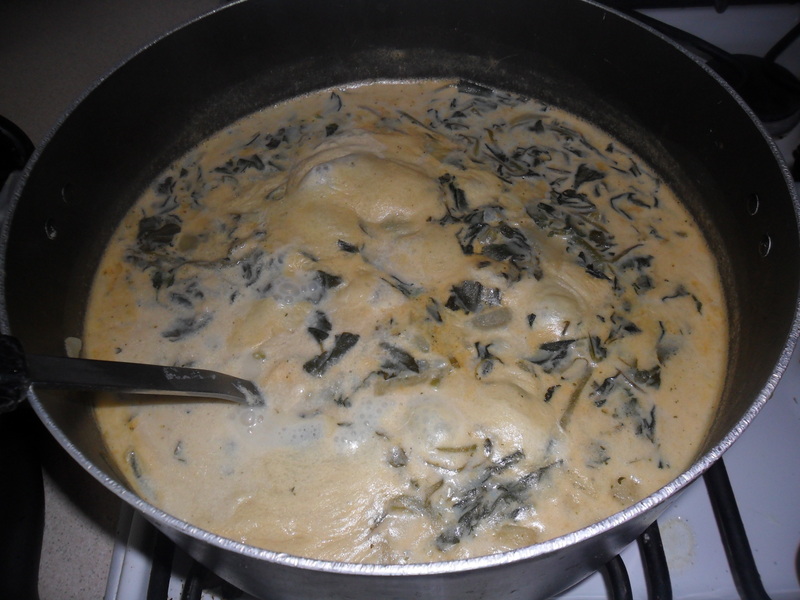 I mix the cooked pasta into my sauce, as this way the sauce goes even further. My family also sprinkle a little bit of cheese on the top of their pasta and they all really enjoyed it. At my allotment today I noticed my green manure is growing nicely. 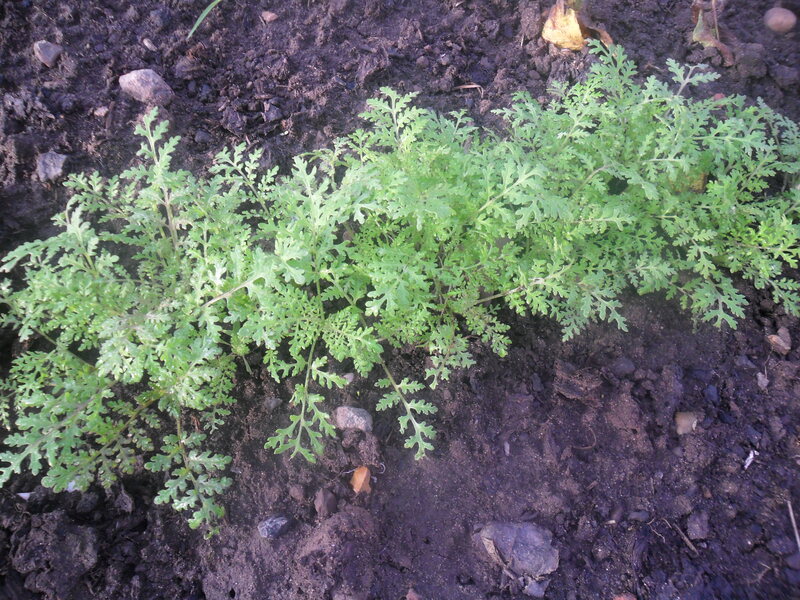 You can read about my green manure here. 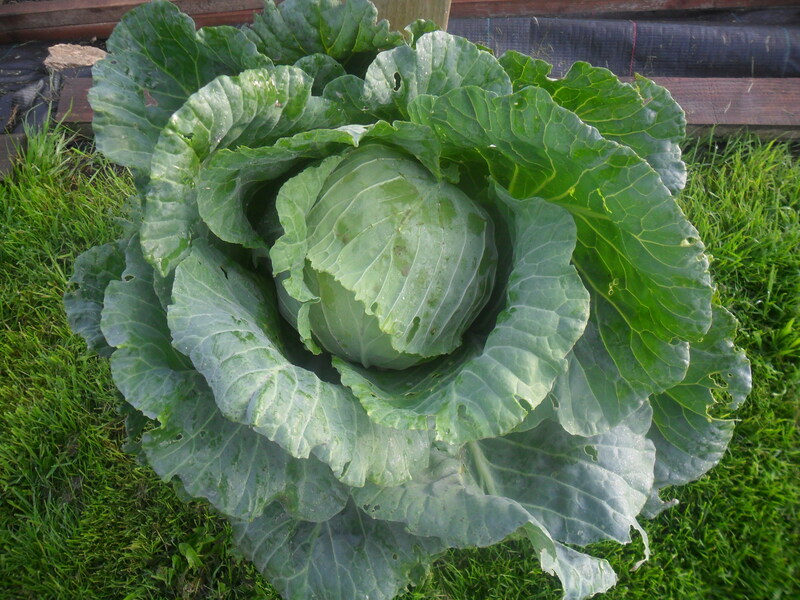 And finally I picked one of my cabbages and I am really pleased with it. This was one of the cabbages that were attacked really badly by flea beatle in May and June. I decided to leave them in and I gave them a weekly feed with a seaweed tonic and hoped for the best. I think they recovered well. 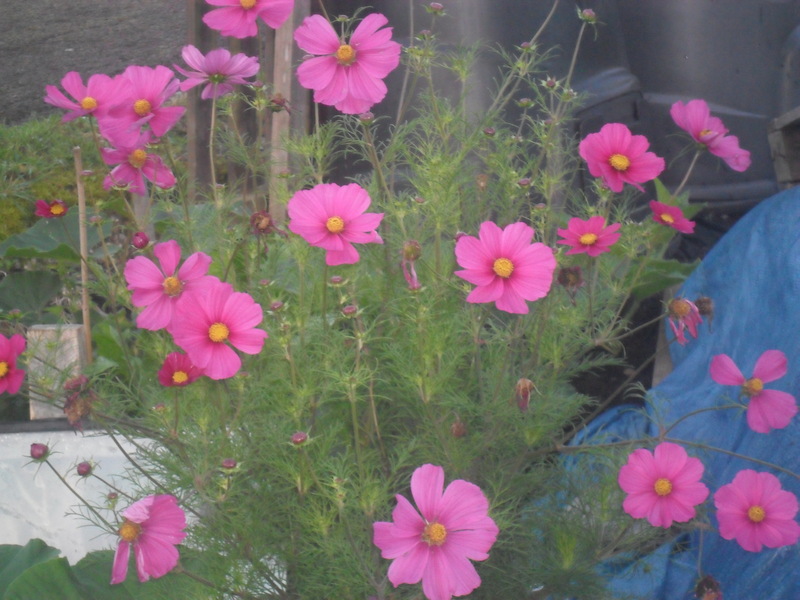 My Cosmos is finally flowering now too, better late than never. 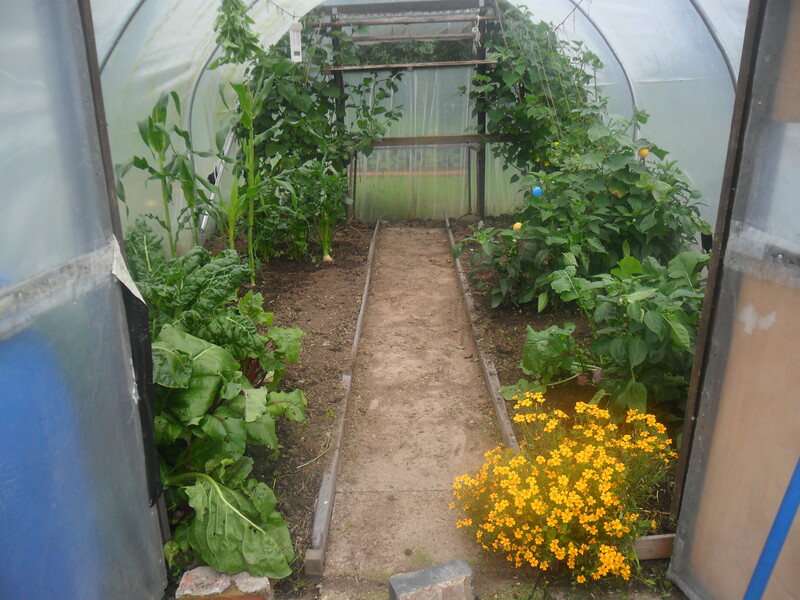 This morning I weeded and cleared my polytunnel of crops that had finished. I managed to pick some onions, carrots, khol rabi and basil to take home. 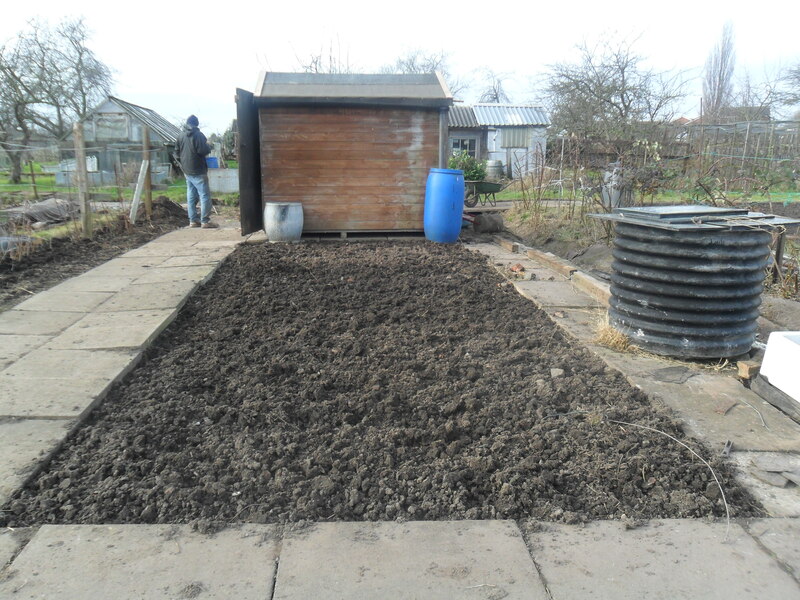 I have cleared some space for my winter lettuces and hardy spring onions that I will plant next month and in the mean time I will be planting a few lollo rosso lettuces. 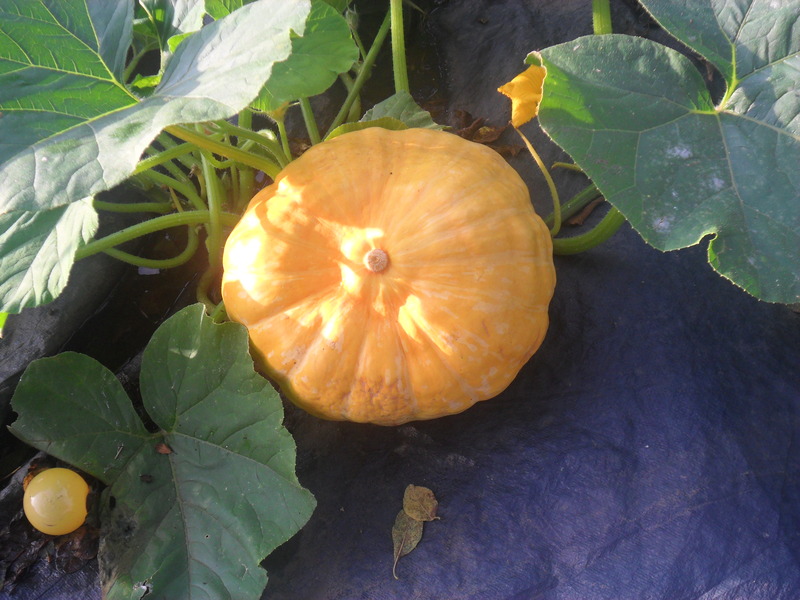 At the moment, I still have spinach, beetroot, cape gooseberrys, chickpeas, turnips, peppers and gherkins left growing in my polytunnel. 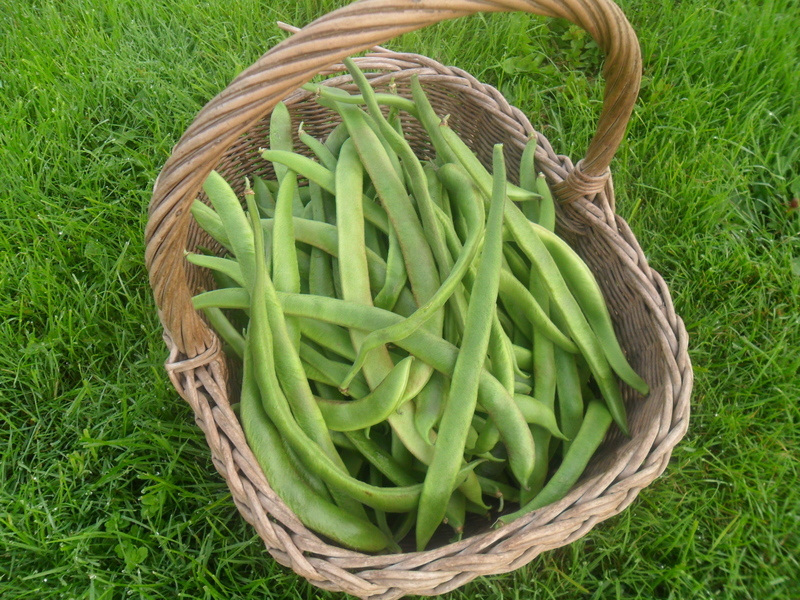 Today at my allotment, I picked another basket of runner beans. I gave half the basket away to my in-laws and I will freeze the other half. 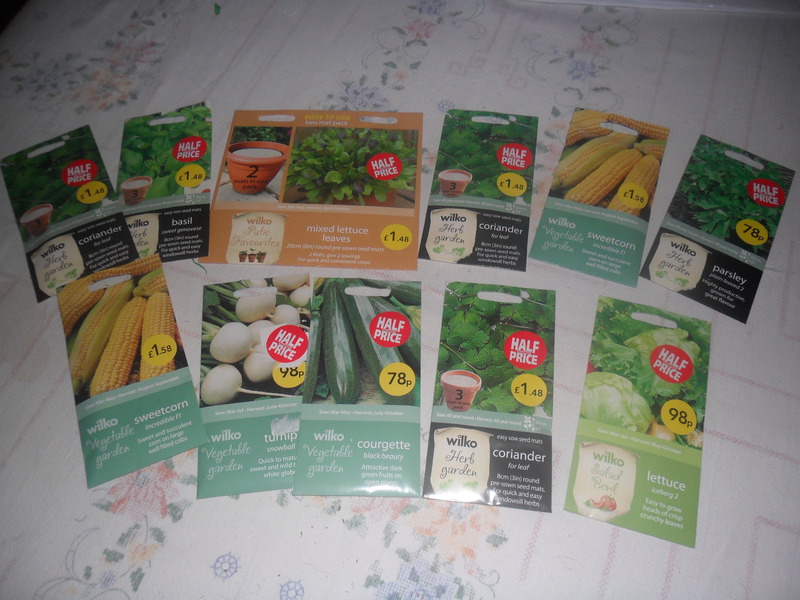 I also found some seeds that were half price today at ‘Wilkinsons’. I always carry a list of seeds that I will need for the following year in my handbag, so if I find any in the sales I can buy what I actually need rather than buying duplicates. 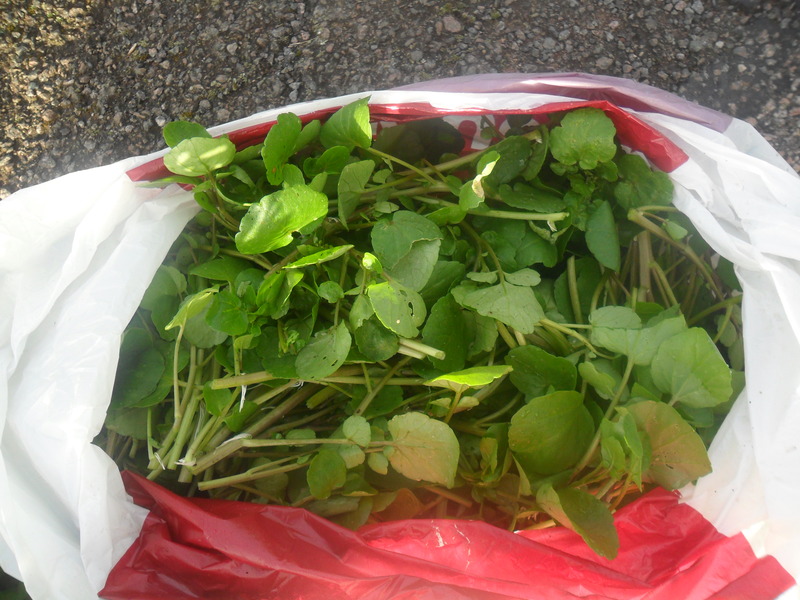 Yesterday I discovered that my watercress had self seeded and given me a second crop, so today I picked a bag full of it and I made Watercress and Potato soup. It’s another easy recipe that tastes good served with homemade bread. 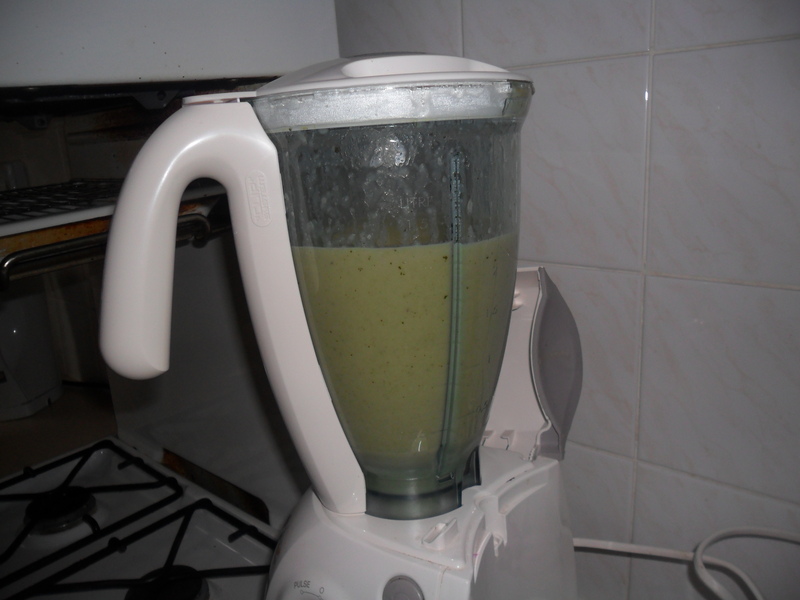 Put the contents in a liquidiser and whizz until the contents are smooth. You may have to do this in batches. 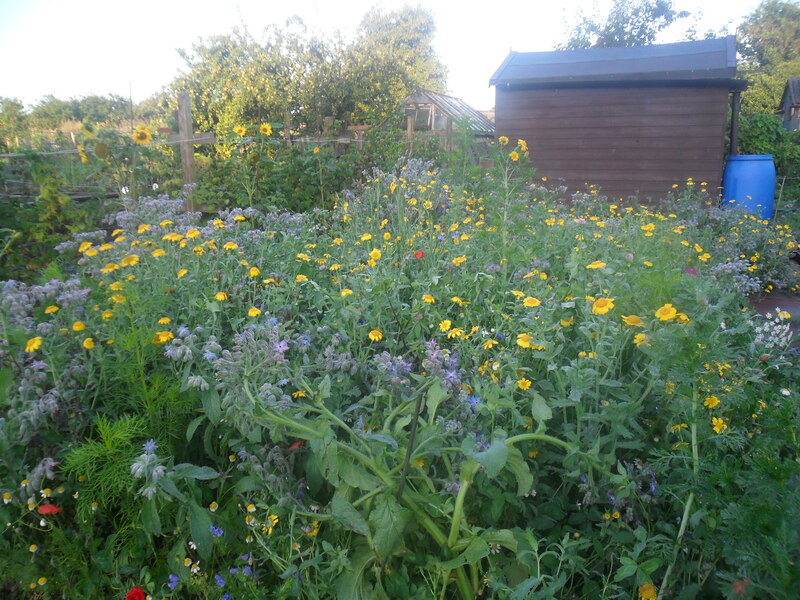 My wildflower patch is still flowering beautifully and I am so proud of it, as it’s my first attempt at growing wildflowers. 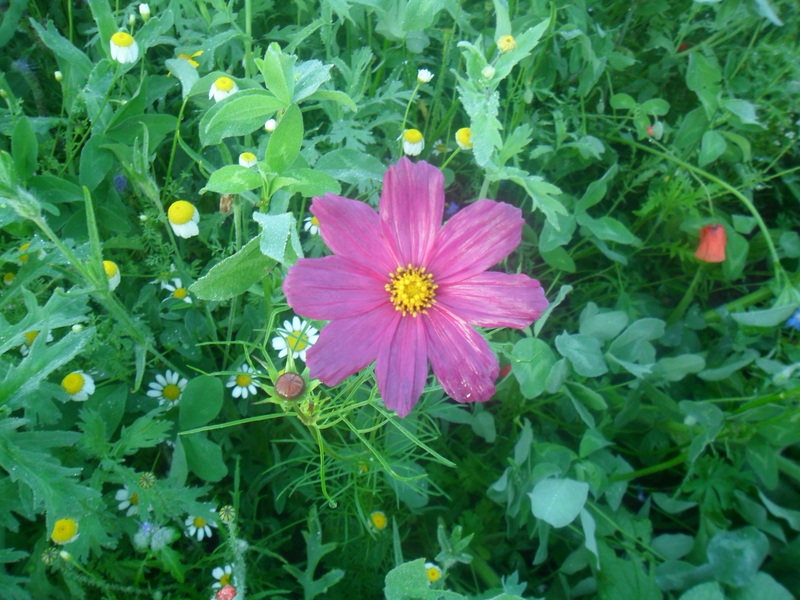 I planted my wildflower patch after I was inspired by Sarah Raven’s television program called ‘Bees, butterflies and Blooms’. 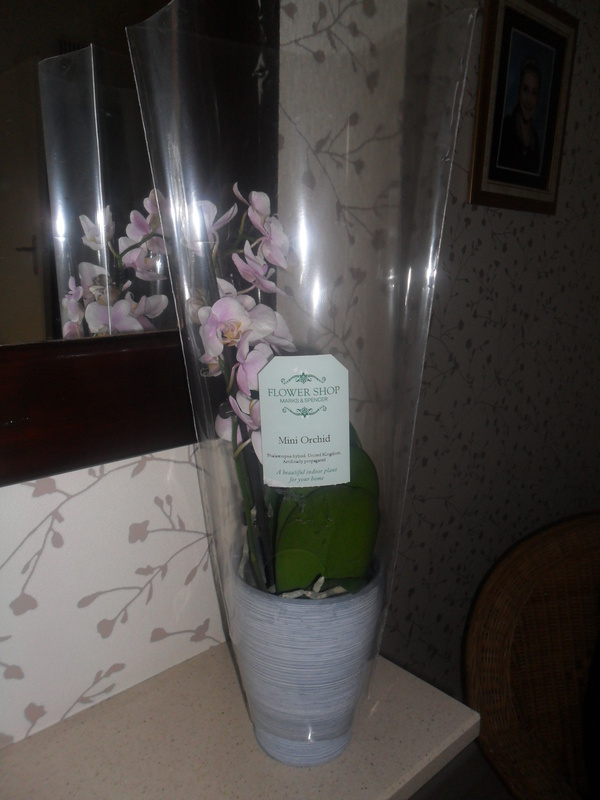 Every time I look at it, I see new flowers. When I take the time to stand and stare, my breath is taken away by the incredible amount of activity that is going on. 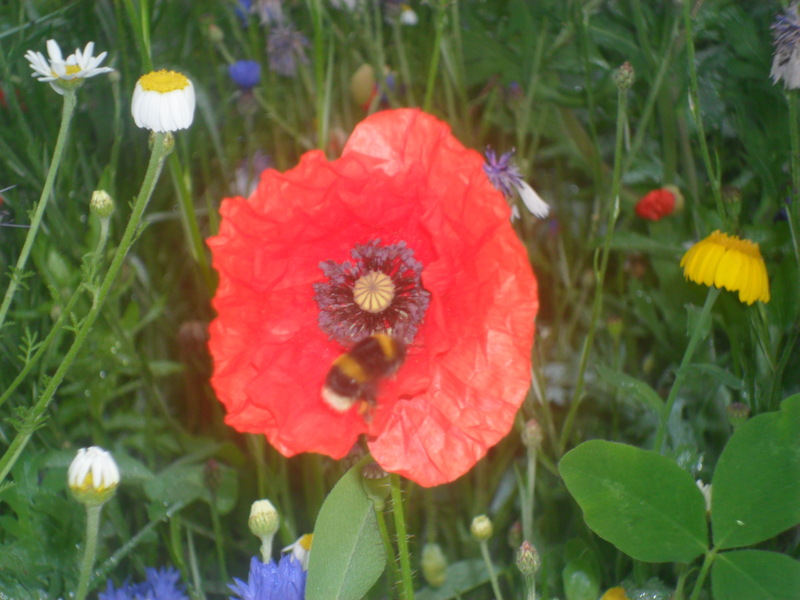 There are so many different types of insects, bees and butterflies, enjoying the flowers. I sense that this must be how mother nature intended our gardens to be. It’s such a shame, as with all the chemicals that have been used since wartime, we have been reducing the population of these insects. I feel very strongly that we must now help these insects to survive. Early this morning, I felt the distinct feeling that summer is nearly over and autumn is approaching fast. This always make me feel a little bit sad. 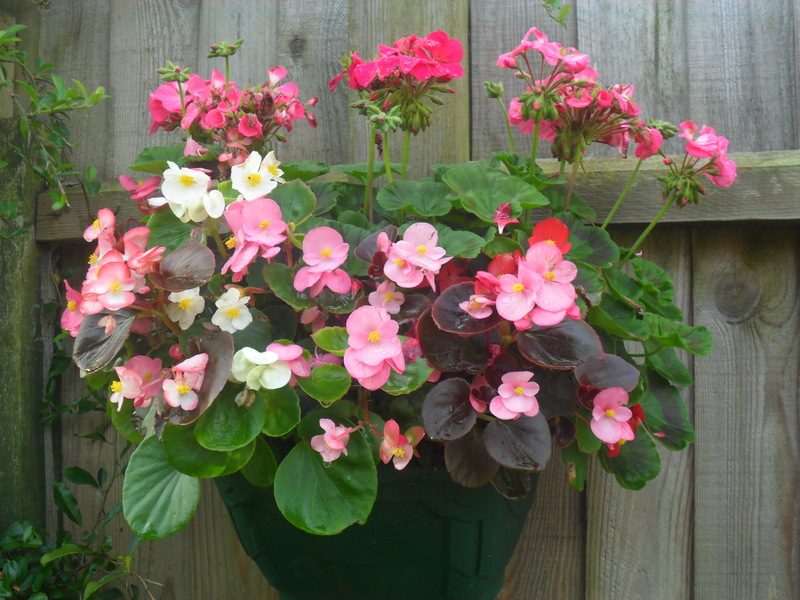 As a gardener, I think you sense the changes in the seasons before others do. I found something on ‘You Tube’ today that I thought I’d share with you. If you read my blog regularly, you will know I have an insatiable love of flowers and the beneficial insects they attract. 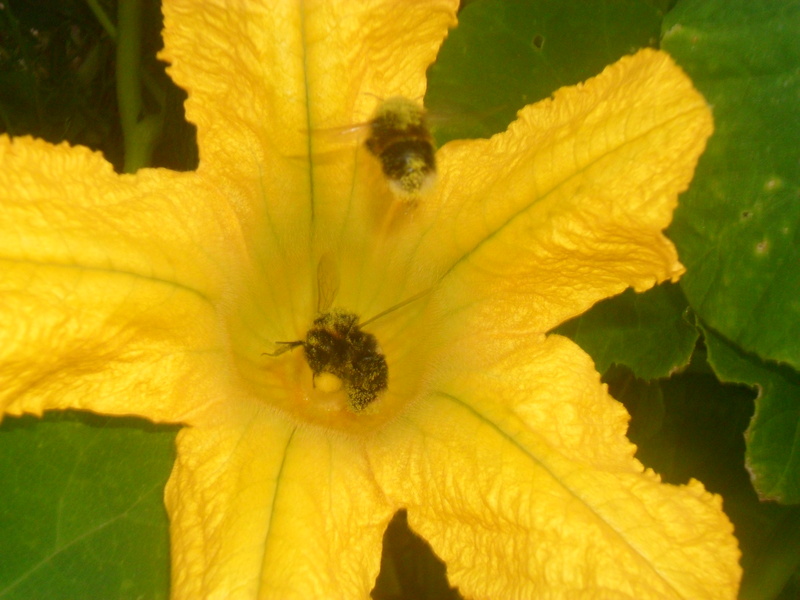 This video shows some wonderful flowers and insects, whilst reminding us that Summer is nearly over. The ghost in the garden feels the season march by. Butterflies and bees poke blooms in the eye. Shivering leaves change color and die. Big dipper drips dew from a clear night sky. 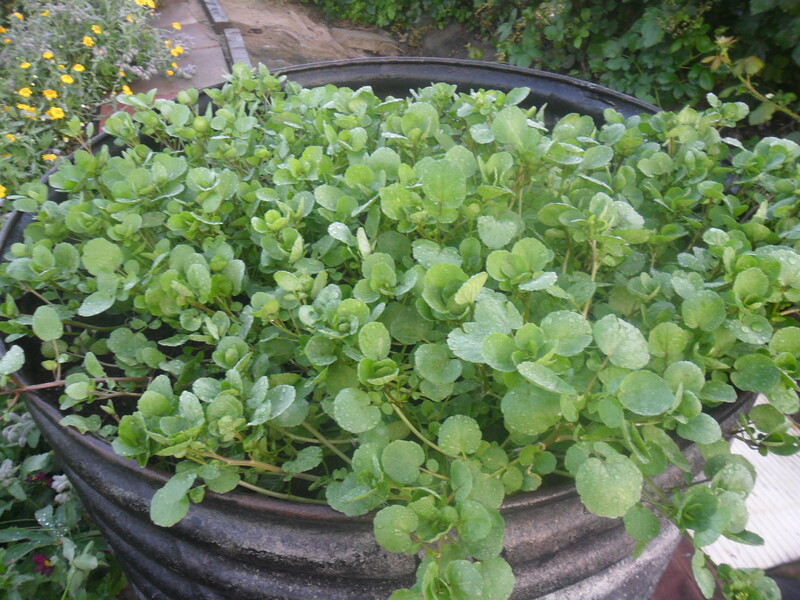 I have a large black barrel at my allotment, that Eric (the previous allotment plot holder), used to grow watercress in. 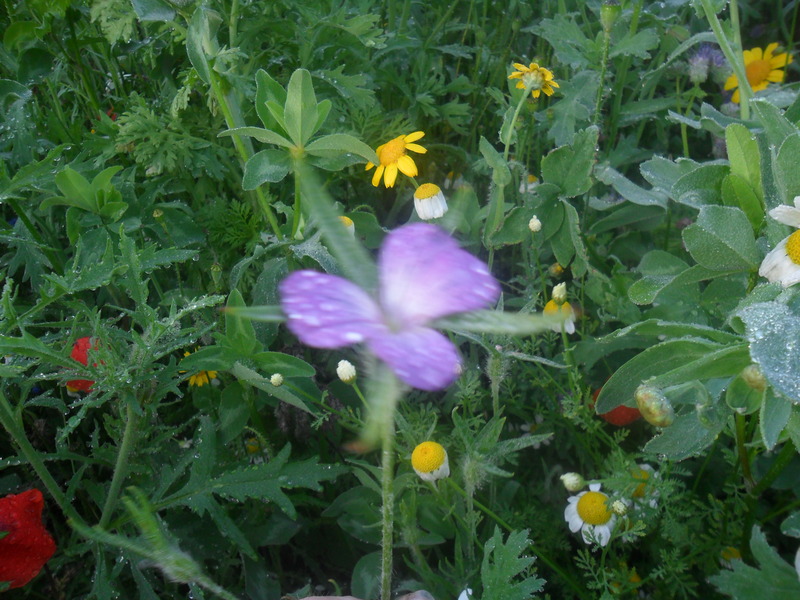 You can see it in the picture below, next to where my wildflowers are now planted. 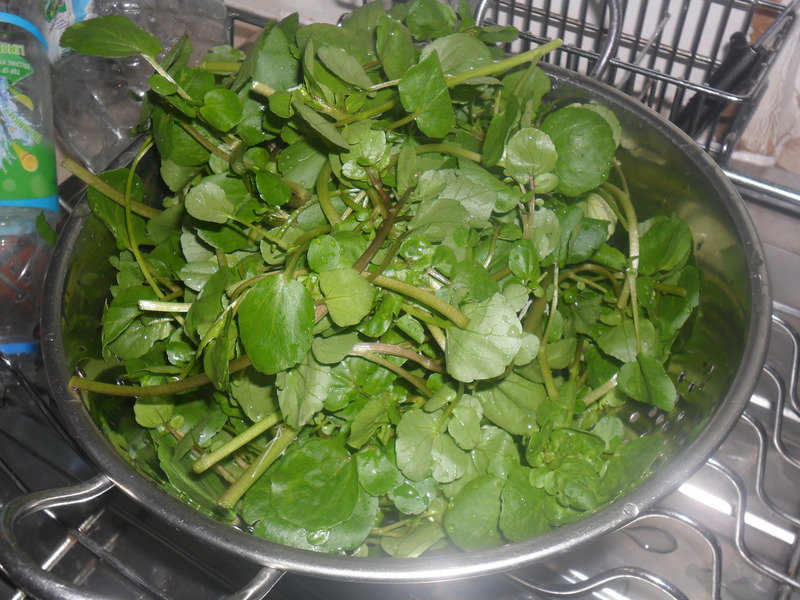 Eric always said watercress grew well there, as the tub was big enough to keep the soil damp. 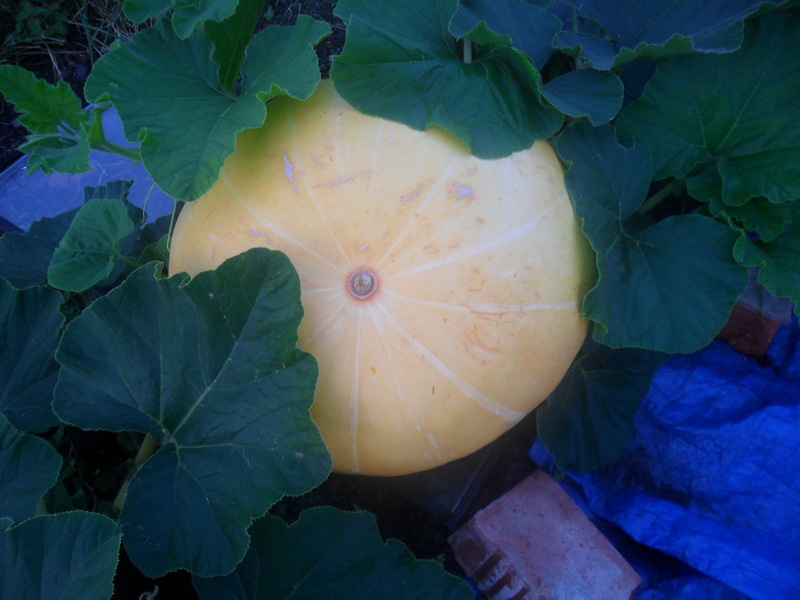 Eric taught me so much about growing vegetables. In the spring, I stripped the top couple of inches of soil and replaced it with some compost and grew a good crop of watercress. 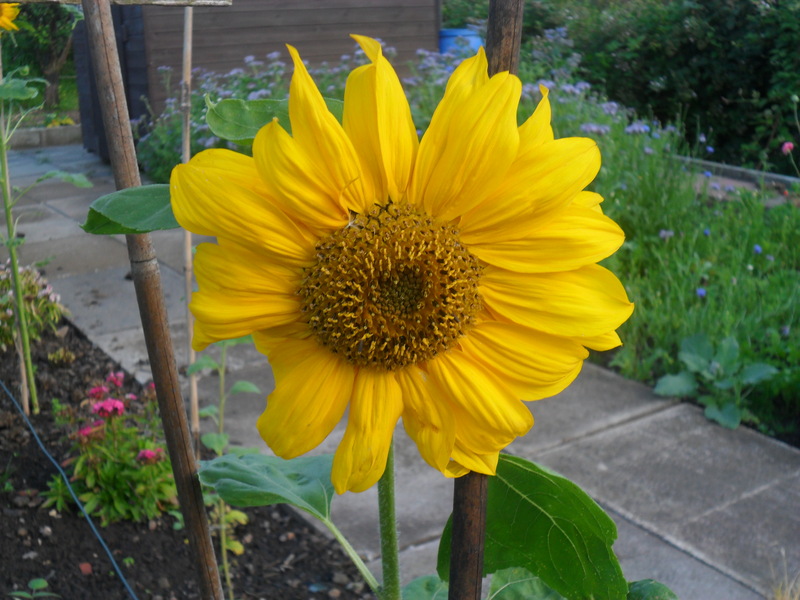 In the middle of July it had gone to seed, so I pulled it all up and never gave it another thought until this morning, when I found it had self-seeded and given me a second crop. So this really is a bonus I wasn’t expecting. The Blackberries this year are big and juicy and there are loads of them. 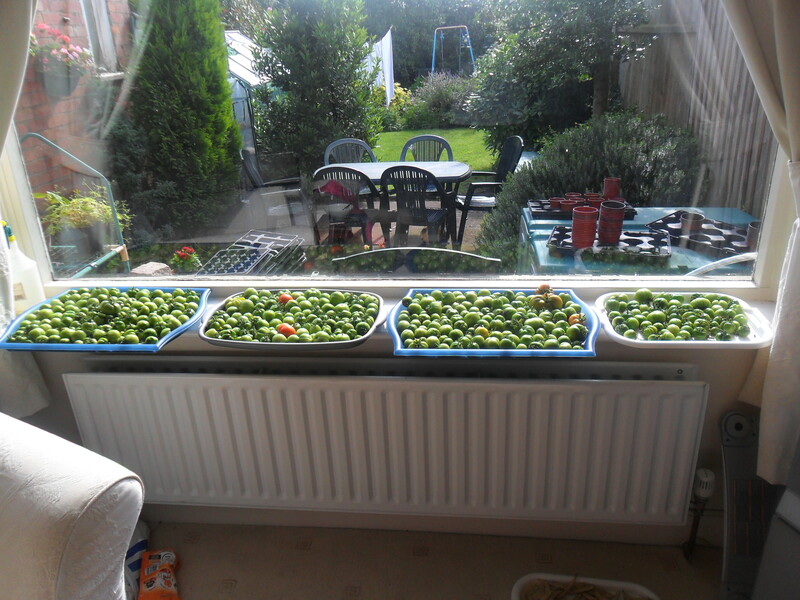 I have been picking as many as I can to use. 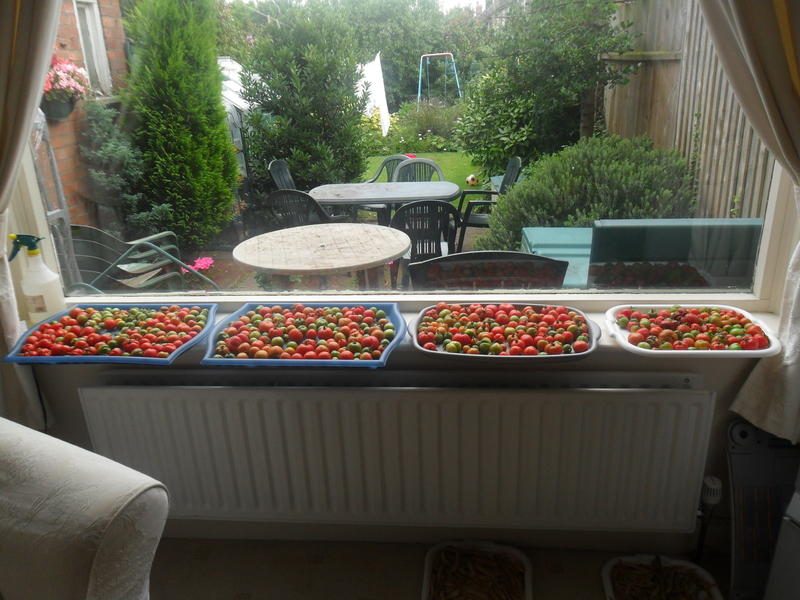 One thing I do use them for is making jam. 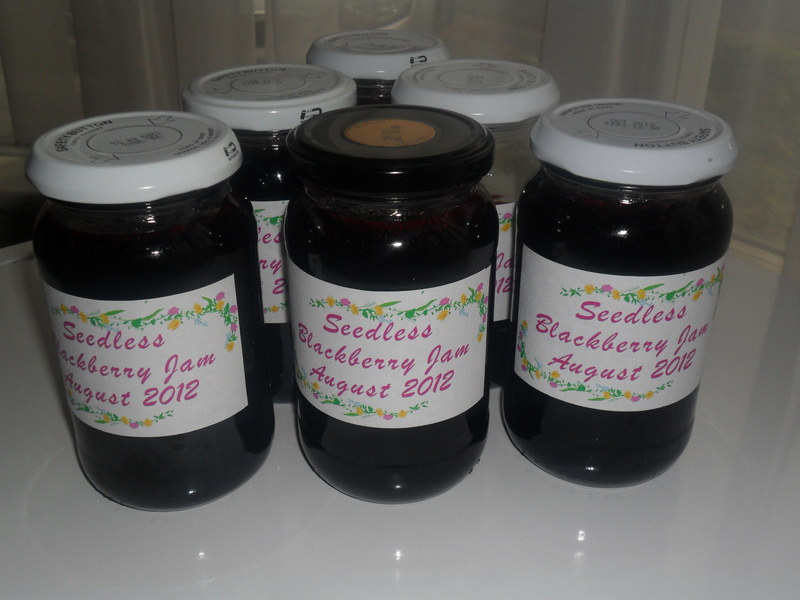 I don’t like the seeds in blackberry jam, (perhaps I’m just getting old, as it never used to bother me), so I made my jam ‘seedless’ this year. I have worked out, that because I picked my own blackberries, each jar of homemade seedless blackberry jam, cost me just 45 pence per jar (454 gram jar) to make. The cheapest jar of blackberry jam I have managed to find is, ‘Hartley Best Blackberry Jam’ (not seedless), which is £1.49 per 340g jar. 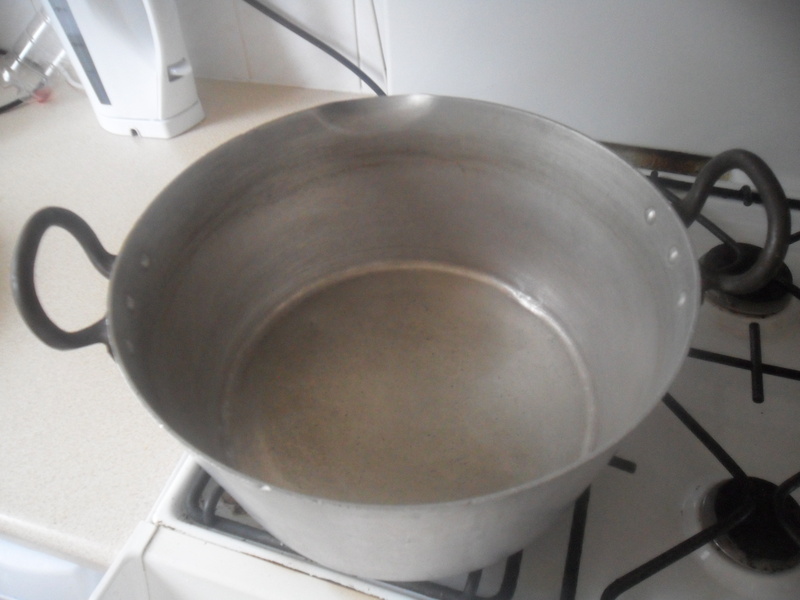 I use a ‘maslin’ pan to make my jam. Mine was second hand, which I purchased for just £10 from ebay and it was worth every penny. 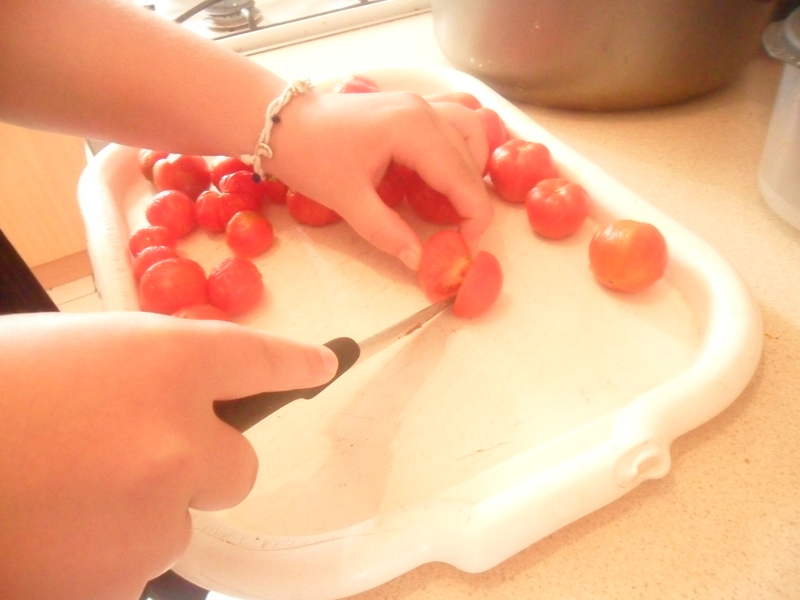 If you haven’t got a maslin pan, you can use any large pan. Just remember the jam boils up high. 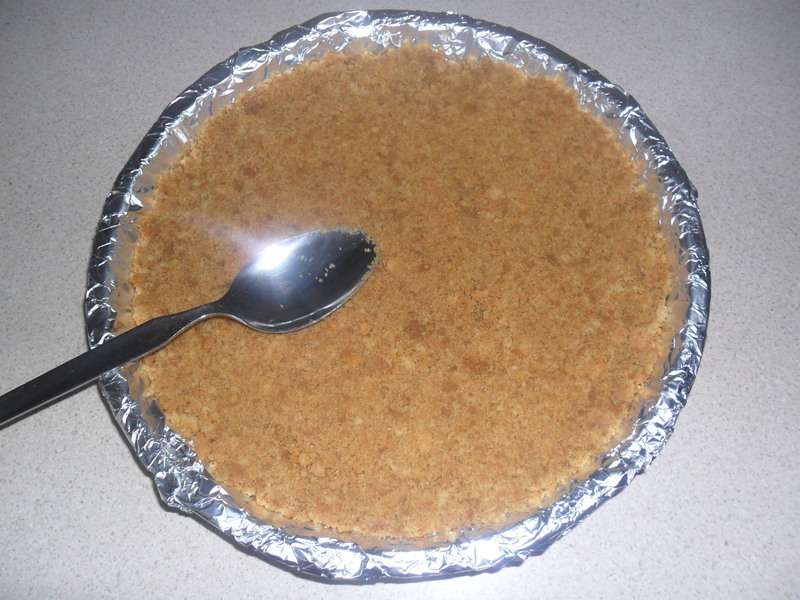 Put the pan on a low heat and stir with a wooden spoon until the sugar has melted and the sugar crystals cannot be seen on the back of your spoon. 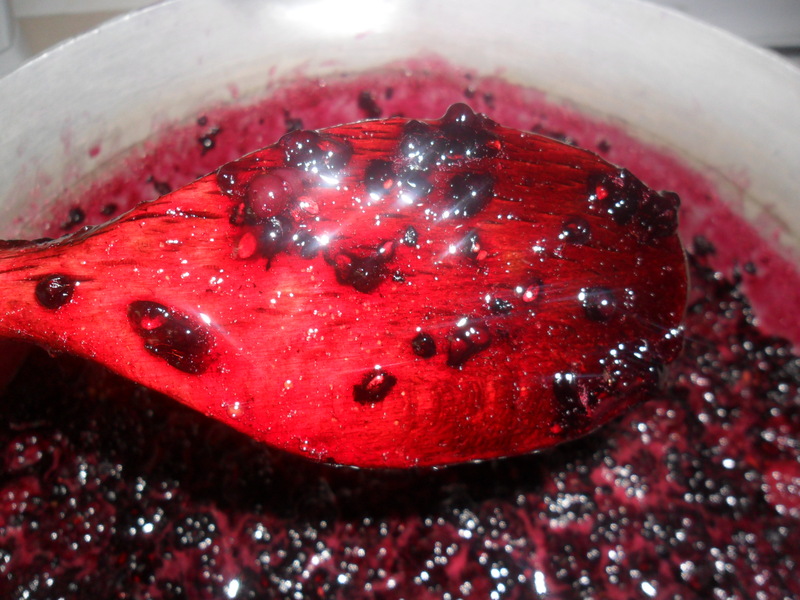 As blackberries have a very low pectin level, add 3 tablespoons of lemon juice per 1lb of blackberries. 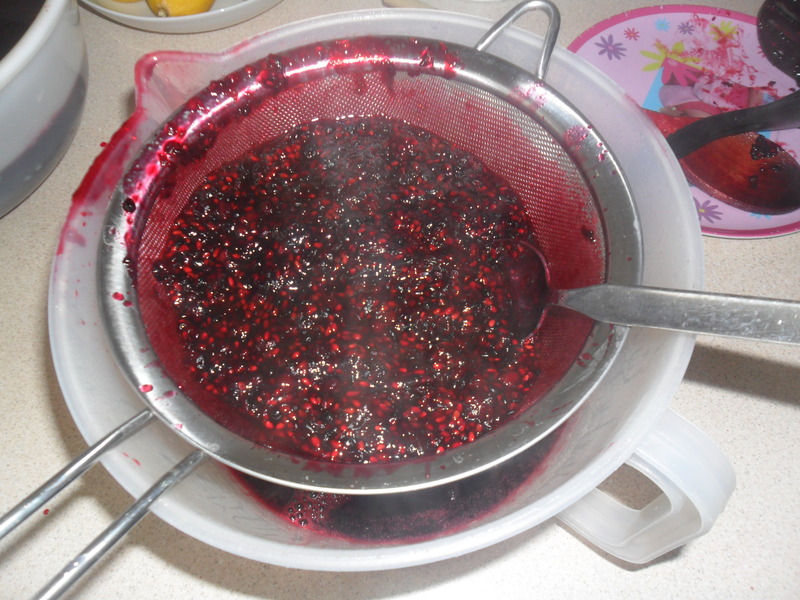 When the blackberries are soft, I sieve them into another bowl to remove the seeds, pressing lightly down on the fruit with the back of your spoon. 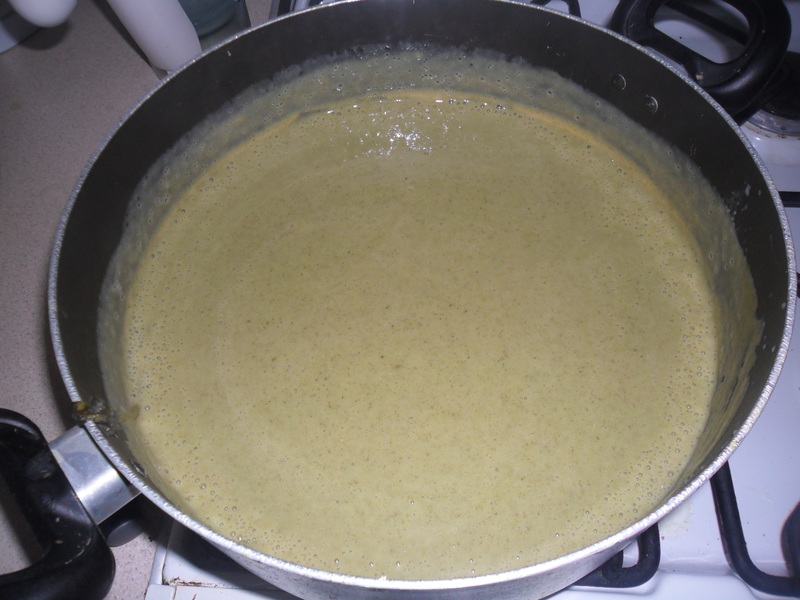 Then I return the juice to the pan and continue to boil hard. After 10-15 minutes, test for the ‘setting point’. 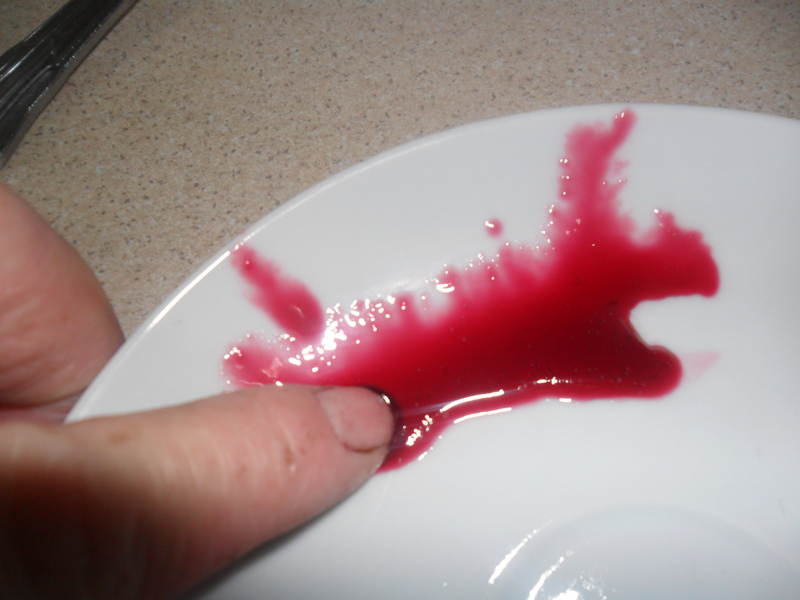 To do this, put a small drop of jam on one of the side plates from the freezer. 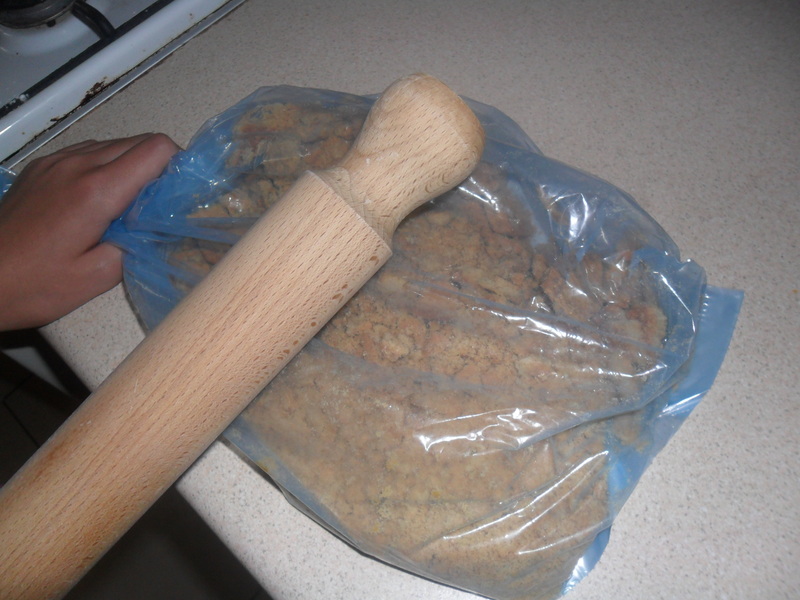 After a few moments, push the jam with your finger and if it wrinkles, it’s ready. If it doesn’t wrinkle, continue boiling hard. 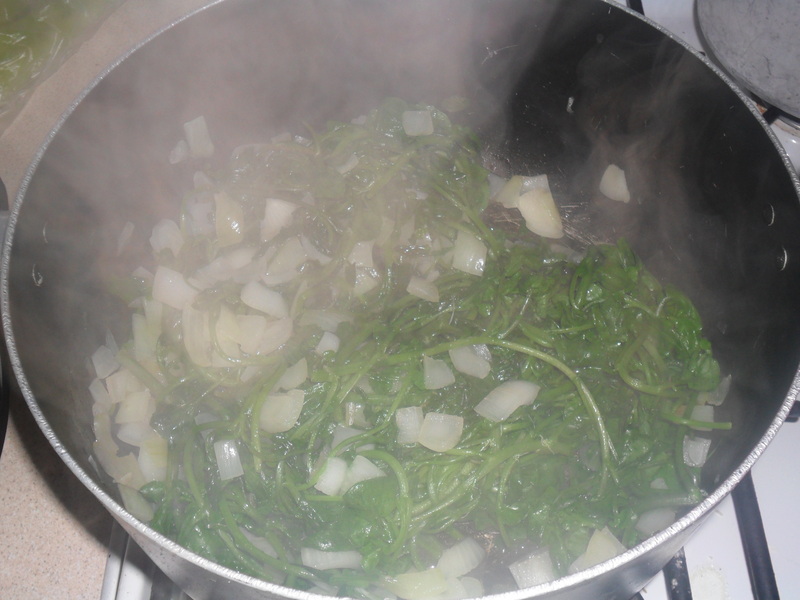 When the setting point is reached, take the pan off the heat and leave it for fifteen minutes. 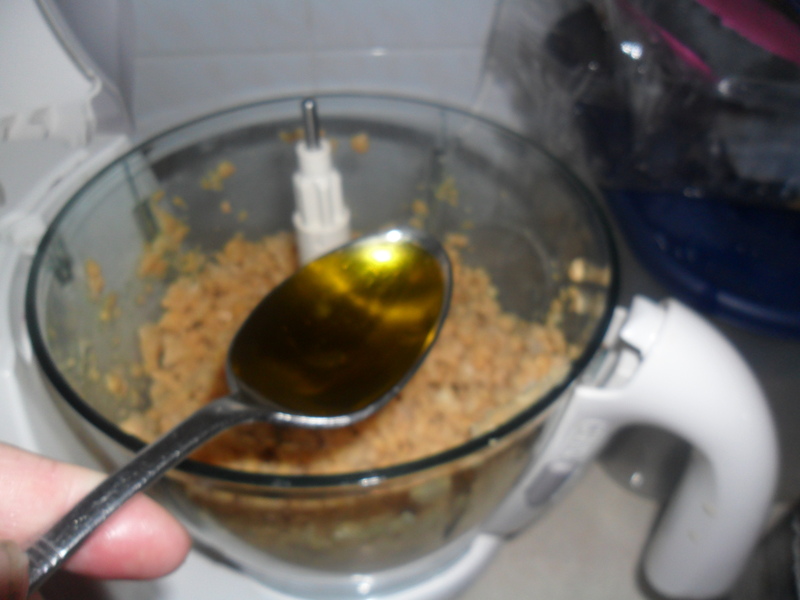 If there is scum on your jam, you can skim it off, but I just stir in a small knob of butter which also reduces the scum. Pour the jam into the jars and seal with lids. I use the jars that have a sealable lid (i.e. the jars that jam is sold in, at the supermarket). This way you don’t need to worry about wax discs to create a seal. As the jam cools, the lids ‘pop’ down and make you jump. The jam stores for ages and ages in a cool, dark place, however, once you have opened a jar, keep it refrigerated. 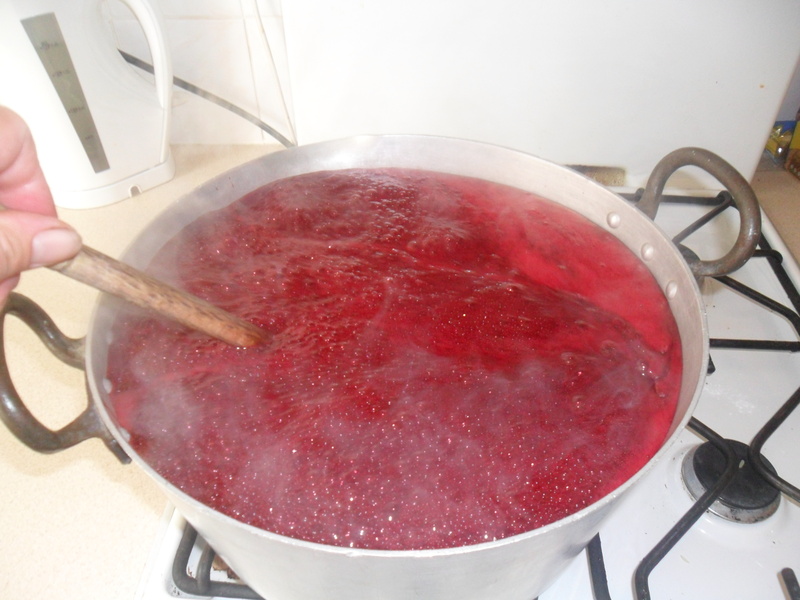 If it’s your first time making jam, there are some jam making tips here (approx half way down the page) to help you. 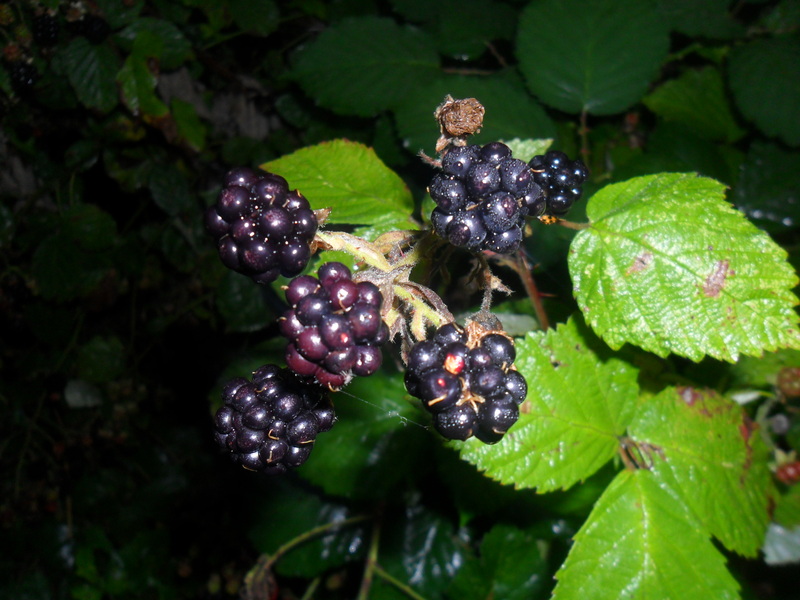 Blackberries are sometimes referred to as “Brambles” and “black caps”. 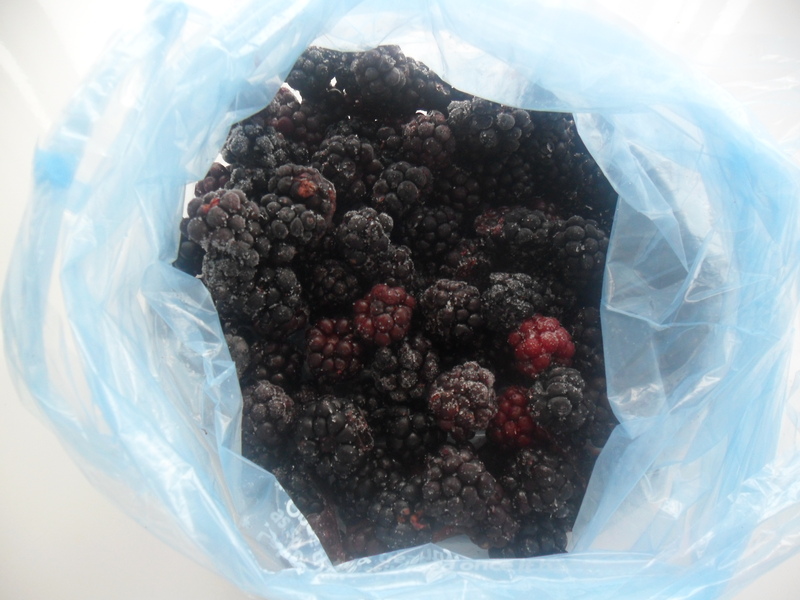 The Latin name for blackberries is ‘Rubus fructicosus’. 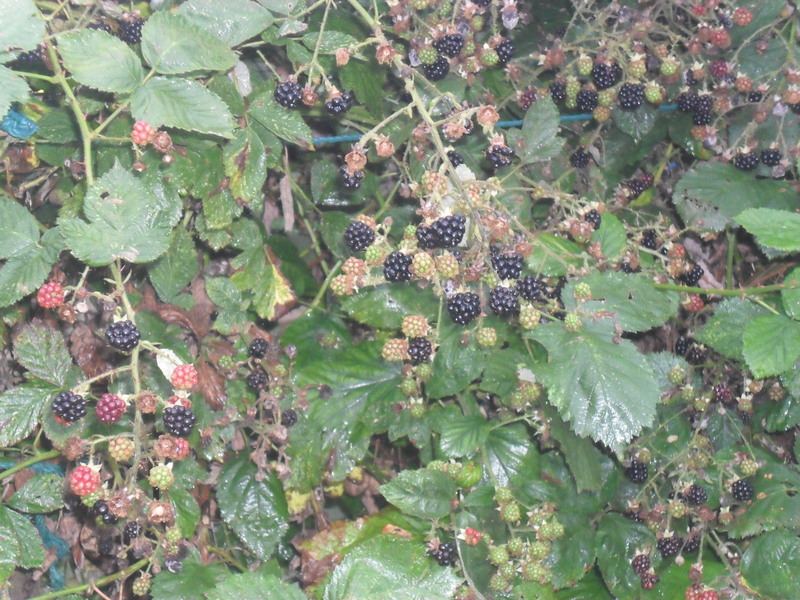 Wild Blackberries are commonly seen in British hedgerows, woodlands and waste ground. 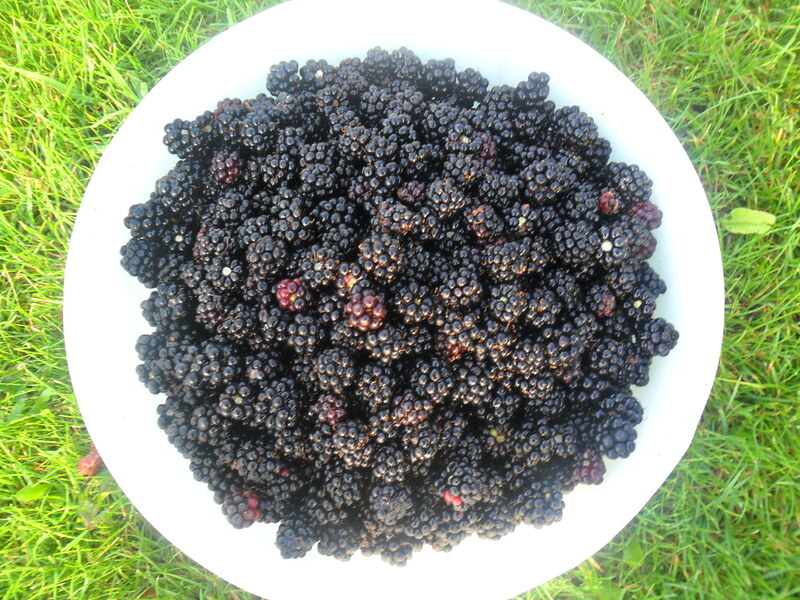 Blackberries are traditionally used in crumbles, pies, jams and jellies, vinegars and wines. Strong ale was brewed from blackberries in the 18th and 19th century. 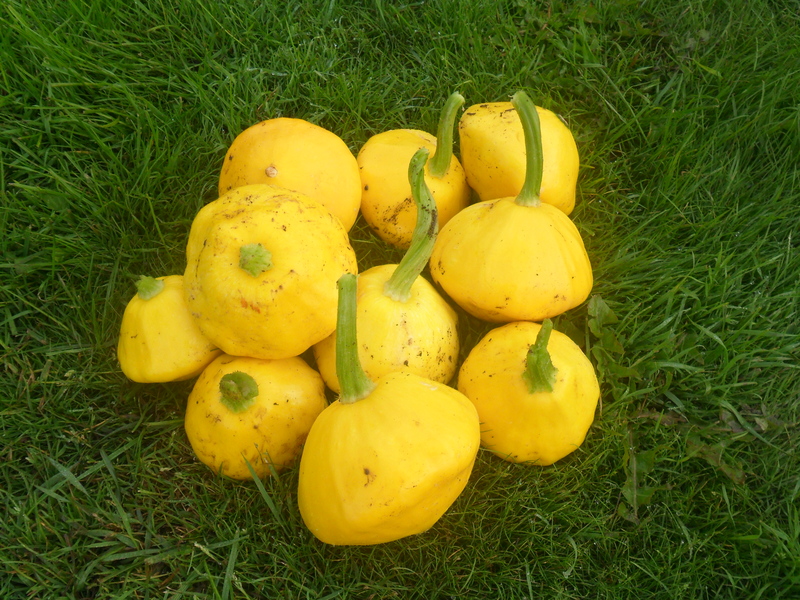 They are a good food source for thrushes, blackbirds and other animals. Blackberries are full of anthocyanin’s (anthocyanin is generally known as a cancer-fighting antioxidant). One cup of Blackberries (approx… 140grams) is about 140 calories. Unripe blackberries won’t ripen once they are picked. Blackberry tea was once used to cure dysentery. Ancient Greeks believed they cured mouth and throat diseases and were used as a preventative against many ailments including gout. The blackberry leaf was once used as a hair dye. 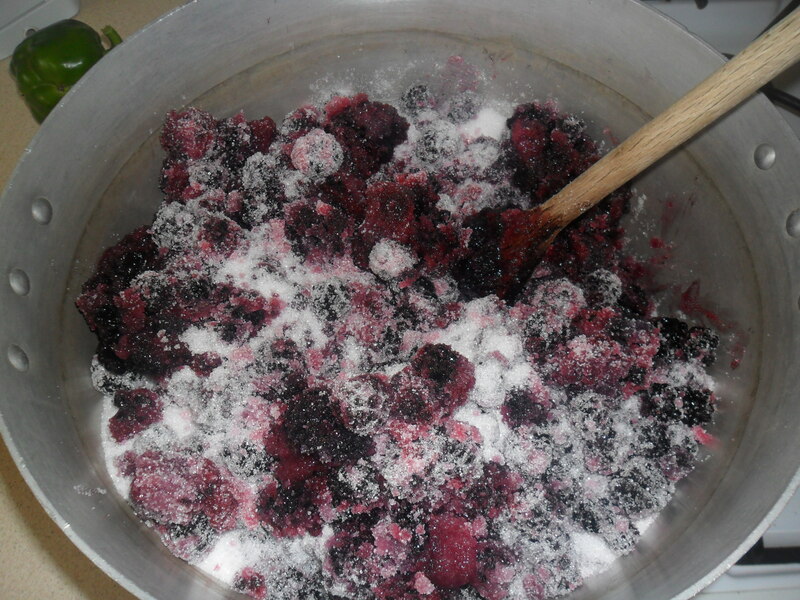 Blackberries go mouldy very quickly and will only store for a couple of days in a fridge, but they freeze really well. Blackberries are known to have health benefits for women due to their high levels of phytoestrogens. These act like the hormone estrogen which is a hormone necessary for childbearing and is involved with bone and heart health in women. 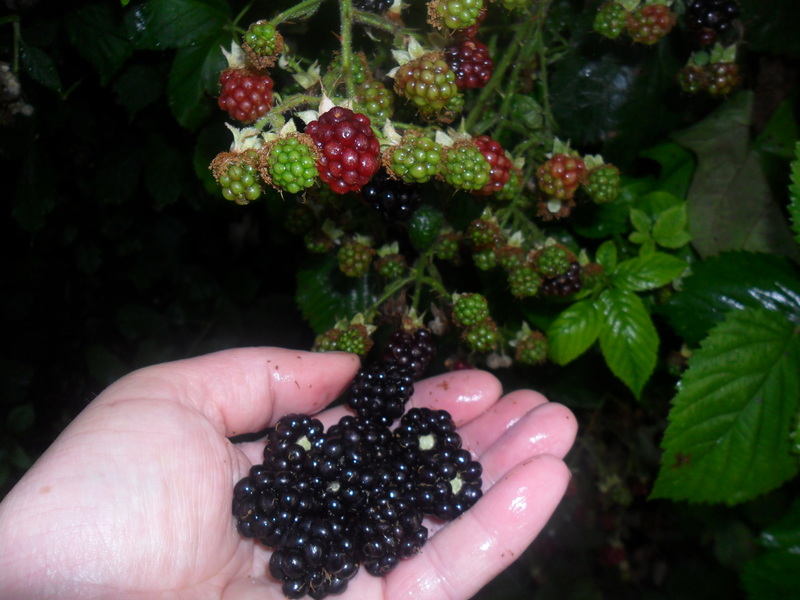 There are around 400 micro-species of wild blackberry growing in the UK. 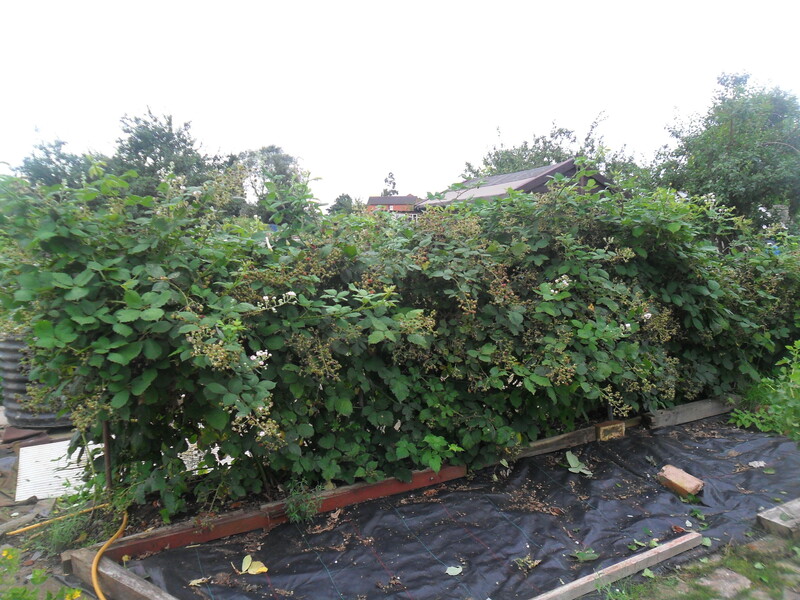 Brambles were used like barbed wire by the ancient Britons. John Gerard was an English herbalist, famous for his herbal garden in the 16th century. 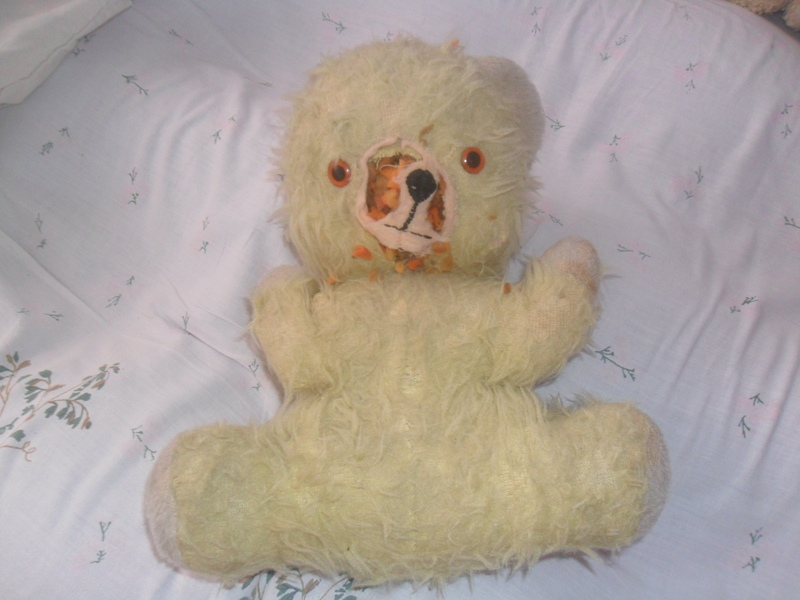 He gave a remedy ‘’for fastening the teeth back in’ using blackberry leaves. 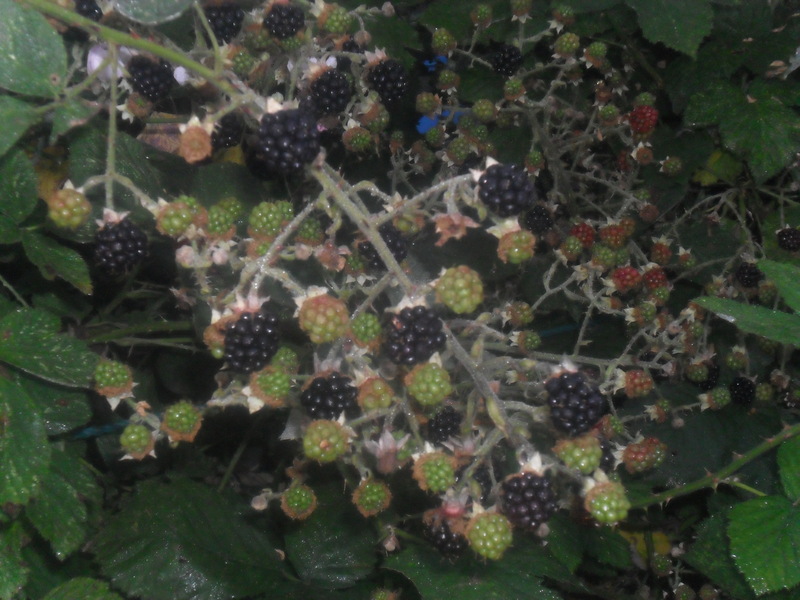 The fruit of the bramble is not a true berry, as botanically it is termed an aggregate fruit. I was very excited on Saturday as my best friend and her family came to visit us. I don’t see her as often as I’d like to, as she lives in Stafford. I can’t ever remember a time when my best friend wasn’t in my life, as we grew up living four houses away from each other. My best friend is one year younger than me so we did have other friends, but she was the one I was always with, out of school. When she was little, she would knock on our front room window and yell “Lisa”, rather than ringing the door bell. We would spend hours playing with her dolls house and Sindy doll, which I was very jealous of, as it was wonderful. 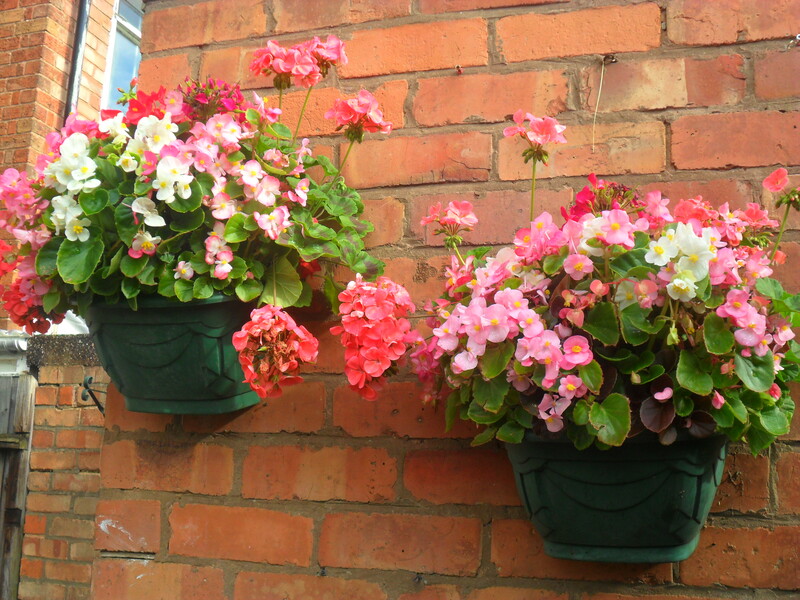 There was one time when we decided to ‘paint’ my alley, (my dad was a painter and decorator at the time) as I had overheard my parents saying it was scruffy. 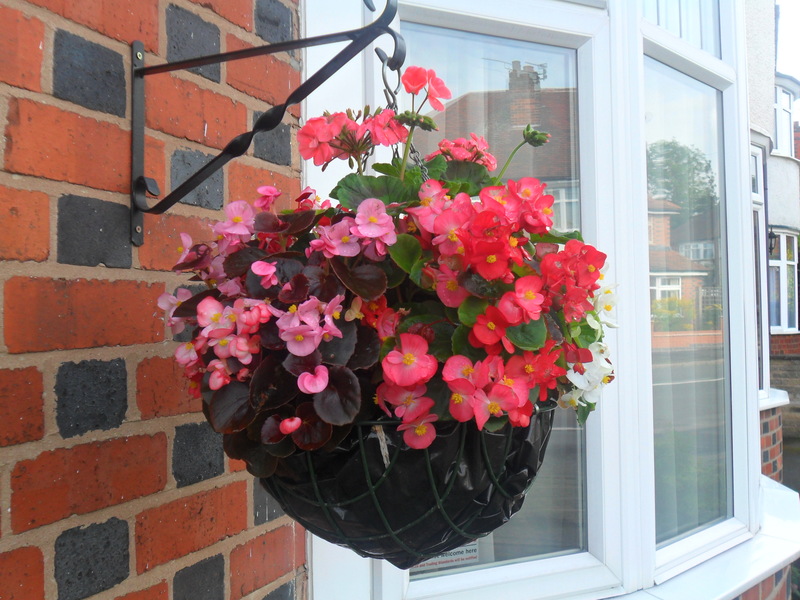 We thought my mum and dad would be so proud of us and we were both shocked when they were angry and told us it would cost pounds to replace the paints, as we had used the same brushes in all the different coloured paint pots. I always remember our Christmas’s fondly, as we would run round to each others houses excitedly on Christmas Day, to show our presents. Her family’s Christmas tree was always to die for, as they had a ‘real’ tree, that seemed so big every year and they were so beautifully decorated. Her family always welcomed me as part of the family. We had so much fun when we were younger. We would talk, play, laugh and dream of times when we grew up and had families of our own and here we were, together with our own families, still laughing and talking. I made some patty pan soup and homemade bread as a starter. For the main course, I cooked a very large roast chicken, roast potatoes, pilaf rice and served it with some pitta, salad, homemade houmous and tzatziki and some shop brought taramasalata. 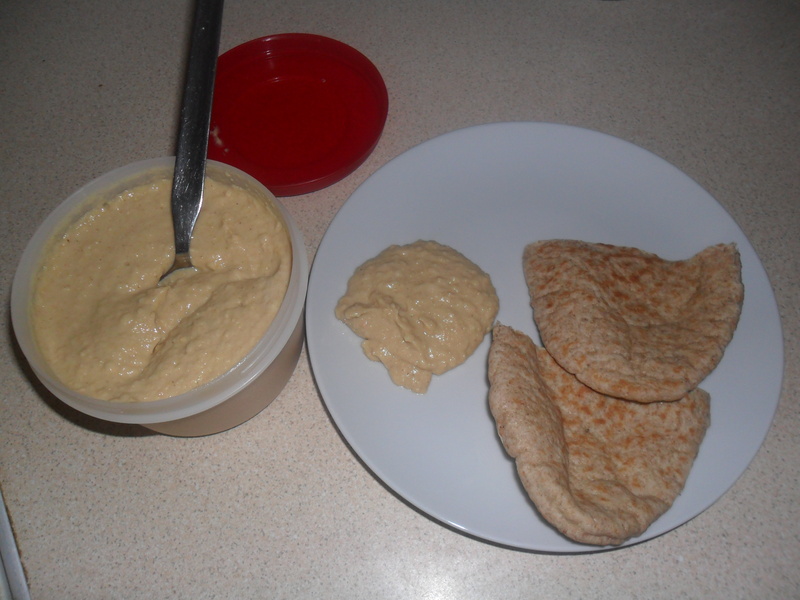 My recipe for houmous is very easy and cheap. Put all the ingredients in a food processor and whizz round until the chick peas are thoroughly chopped and it’s creamy. That’s all there is to it. I make my own yoghurt and grow my own garlic which makes it even cheaper for me to make. I buy larger packs of cumin and my tins of chickpeas from the ‘world food’ section in the supermarkets, as you usually find cheaper brands in this isle rather than the brands you find in other isles (the supermarkets are so crafty). 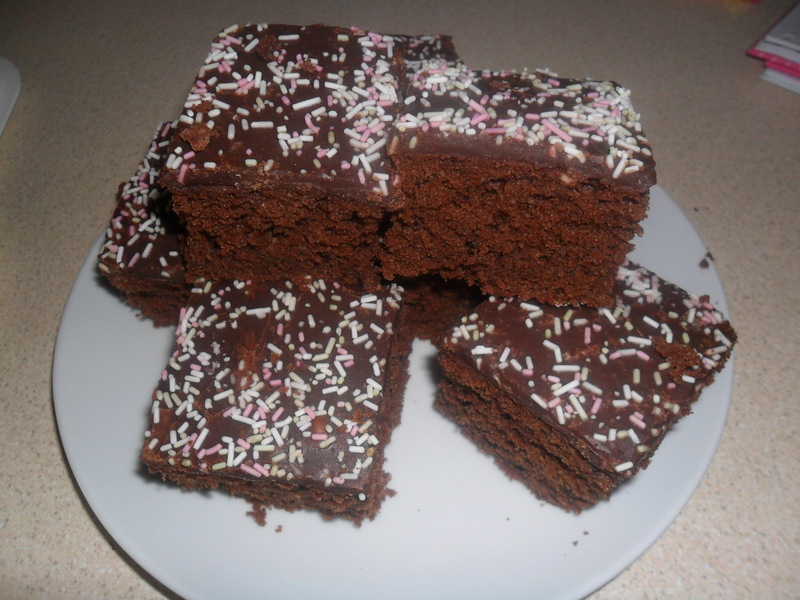 The recipe for this cake is here. Also I wanted to make something extra special, so I made a Luxury Lemon CheeseCake. 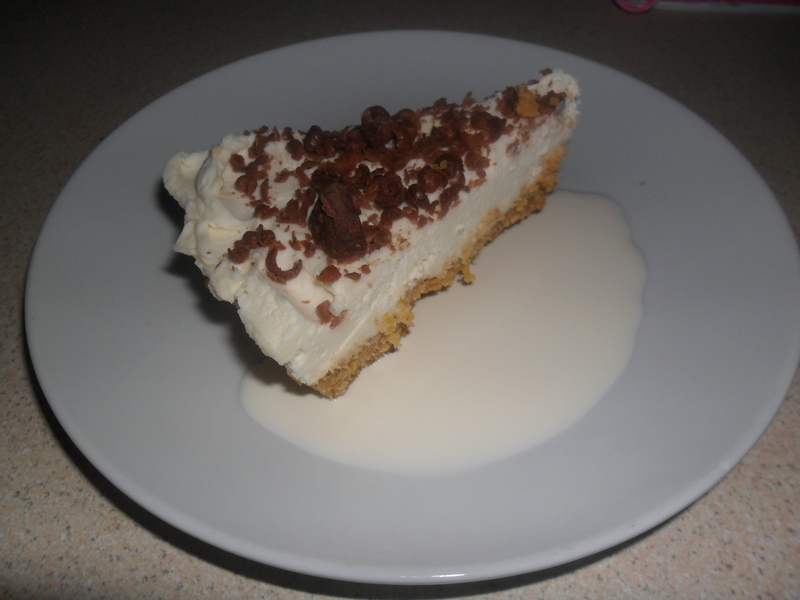 It isn’t cheap to make, but it tastes divine and it’s another very easy recipe and it doesn’t involve cooking it in the oven. 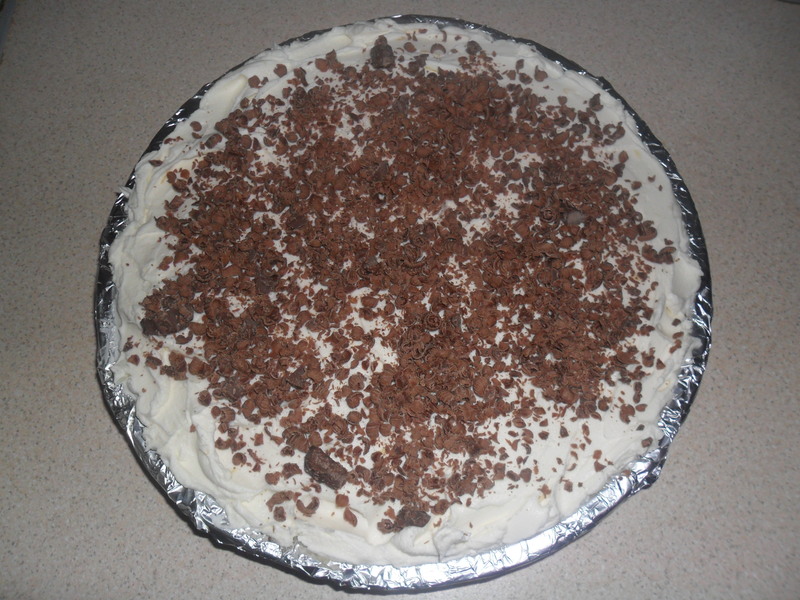 Put the base in the fridge to chill for an hour before making the topping. 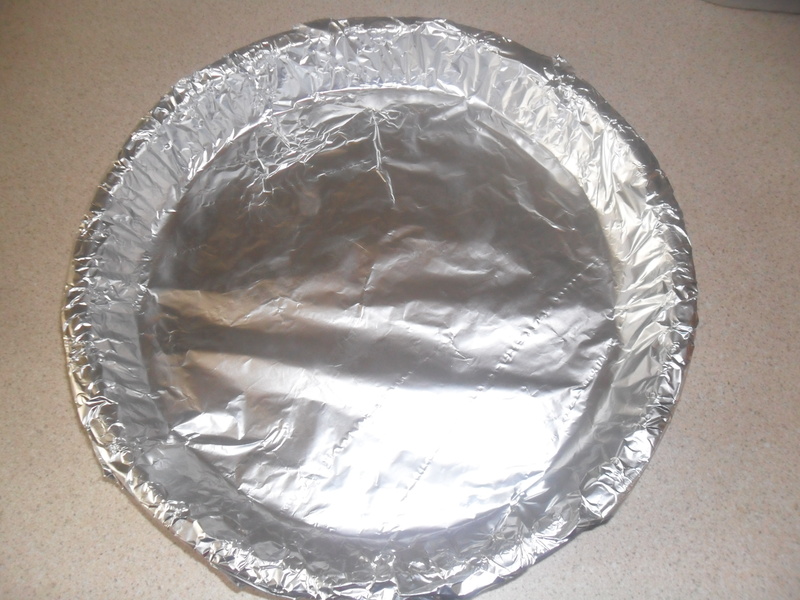 Leave in the fridge over night to ‘set’ as this makes it easier to remove the cheesecake from the tin and foil. I had a great time with my best friend and her family, I feel very privileged to have a friend like her. I pick a different blog each week, that I particularly enjoy reading. I will then post a link for you to check it out, to see if it interests you too. The lady that writes this is the daughter-in-law of one of my allotment friends. She also lives in Leicester and if you scroll down her blog you will see the result of the strange weather that we have been having this year. Look for the post on the 2nd July. I particularly like the way she makes things out of charity shop finds. I wish I could sew clothes like she does. There is also a wonderful pair of ‘DIY Dip Dyes Shorts’ that she made. She has really good ideas. 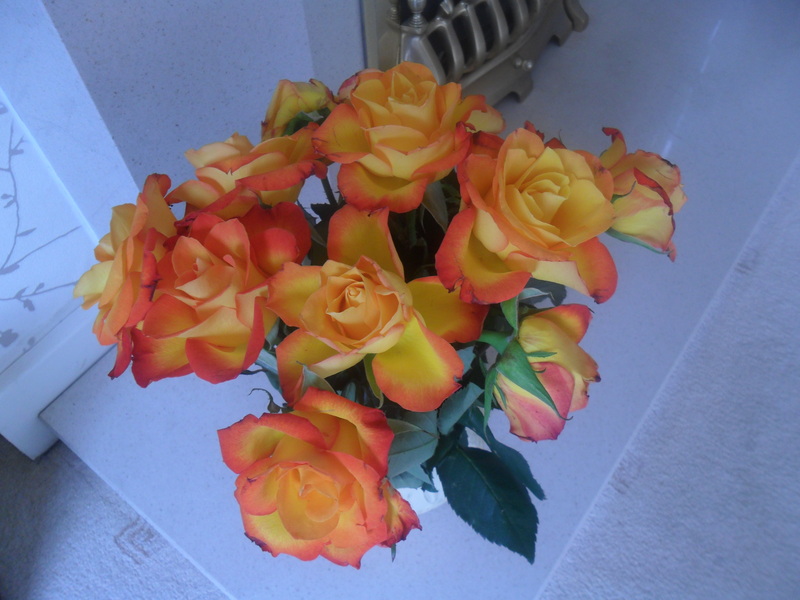 I will be back again on Monday, hope to see you then. 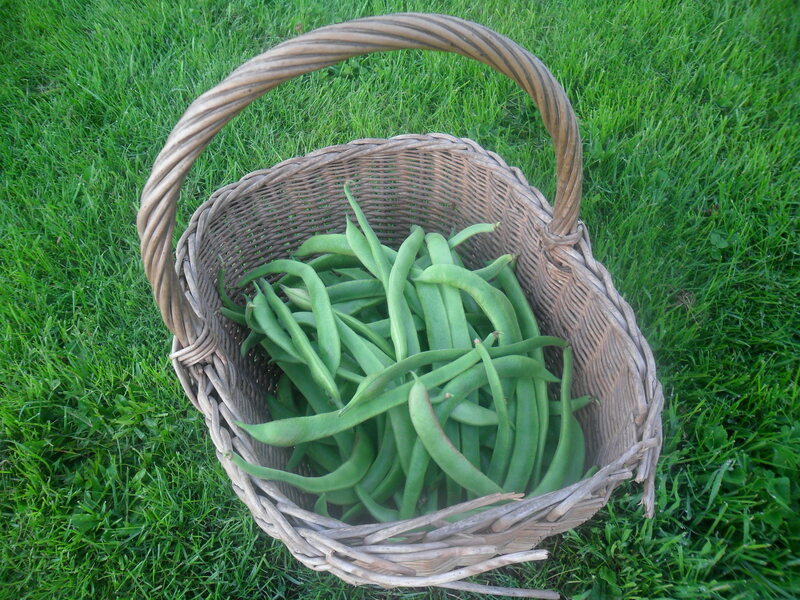 This morning I picked some more runner beans, which I will freeze for the winter and I dug up some more potatoes. When they are cool, I freeze them. 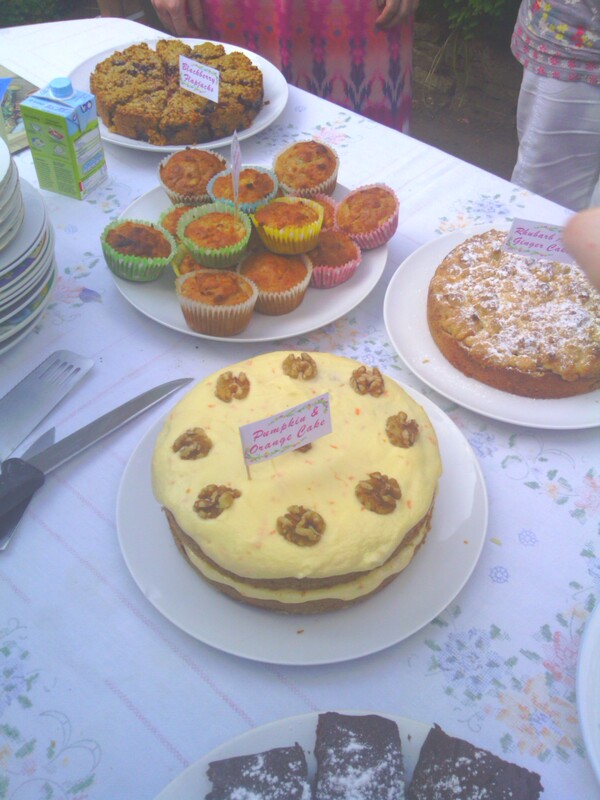 On Sunday, I made lots of cakes for ‘Afternoon Tea’ and I will be writing the recipes on my blog, over the next few days. Today I thought I’d write the recipe for Pumpkin and Orange Cake. 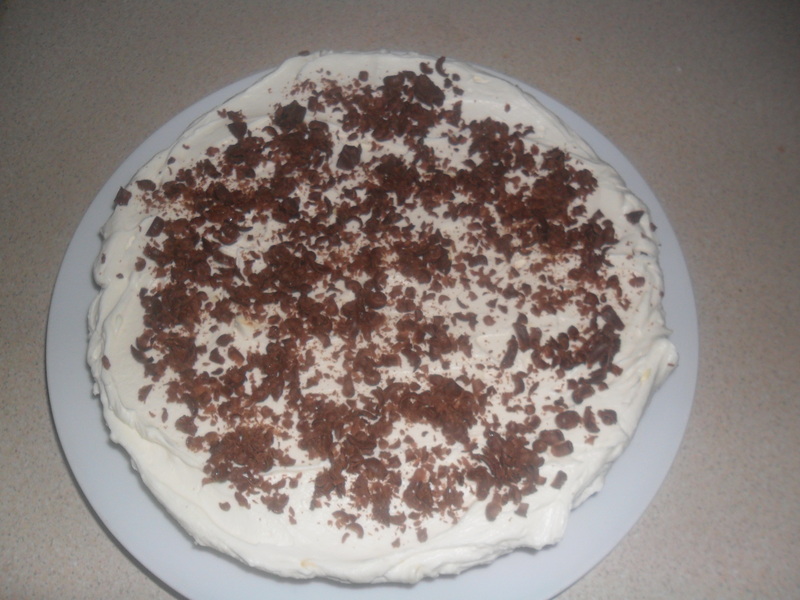 This cake tastes very similar to carrot cake. It really is a lovely tasting cake. The pumpkin I used was still in my freezer from last year and needed to be used up. Beat each egg one at a time, adding 1 tablespoon of the flour mixture in after each egg. Fold in the remaining flour mix and the pumpkin. 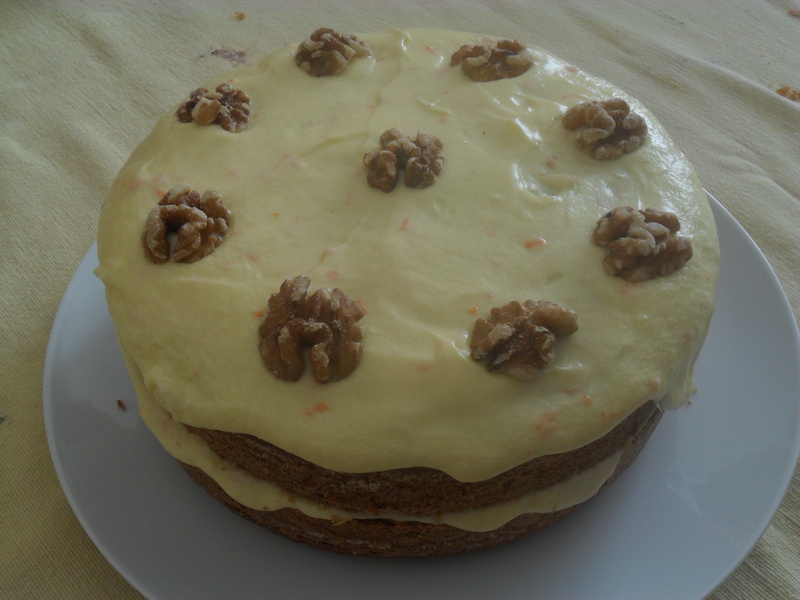 I used walnuts to decorate the top, but you could use some more orange zest.